The description of my Orlando vacation from five years prior is over here. This is an update in 2016. Orlando is a great place for a family vacation – we love it. It’s designed for vacations with typically great weather around the whole year and lots of inexpensive flights and places to stay. Plus, the people seem to be mostly transplants from the New York area so their ‘cultural’ ways are familiar to many of us. They drive a whole lot slower though and their traffic lights are long. The downsides are that there’s not much to speak of for kosher food and minyanim and the entertainment is expensive. If you want to be near a minyan, Chabad of South Orlando recently moved to a new larger building down the road from where they used to be. Their at 7347 W Sand Lake Rd, Orlando, FL 32819 and their website is www.jewishorlando.com. They have regular Schachris, Minchah, and Maariv minyanim. They are no longer as close to the hotels but if you’re willing to walk .5 to 1 miles, there are plenty to come by. It’s in the ‘north’ with respect to the parks, near SeaWorld and Universal Studios. Update: It turns out also near this area is the Orlando Torah Center which is in a residential area with vacation house rentals, is building an Eruv at the time of this writing, and also has three minyanim a day. I did not know about this before my current trip but a comment below informed me. There’s always next time! The heated and fenced in private family pool with jacuzzi was the star of the vacation. That’s what we did on our earlier trip. However, it no longer makes sense for us to stay in hotels and I’m not sure it makes sense for most people to do so . . . especially not in the Orlando, Fl area. About a half hour drive to the south in Kissimmee are hundreds of houses for rent – they’re within 30 minutes of the larger parks and for the same price as a hotel room, you get an entire house with kitchen that you can kasher and your own private family swimming pool and game room. Our kids liked our house better than the Disney parks. (One child said it tied with Magic Kingdom – only a ticket just for one child at Magic Kingdom cost about the same as the house rental per day). I know people who’ve stayed at Disney hotels and get packaged Kosher food brought to them … there are no minyanim (well, see below) and it’s quite expensive but you can hop on a monorail to get to the parks. If you’re only going to Disney parks and can fit everyone into one hotel room, maybe it’s worth it to you. This is what I found – Walt Disney World tickets are no cheaper anywhere else. There are no discounts that are worth it. Just buy your tickets at the gate. SeaWorld – Undercovertourist has the best deal – about 20% off. They are also a pleasure to do business with. They have a calendar telling you how busy a park is on a given day, presumably based on ticket salses and if you don’t use your ticket, they’ll refund 95% of the cost. Universal Studios – Chabad of South Orlando had the best deal here. You can pick up your tickets when you go to daven there, or you can pay to have them mail you your tickets. I do not think they are refundable. The British section of Epcot – sadly, my kids didn’t know how to hang up a pay phone when they were done. The Publix supermarkets have some amount of kosher food. Each Disney park has a restaurant with pre-packaged kosher food. It’s gotten a bit better in quality, but still nothing too great. If you call ahead at least two days, they will have kosher food brought to any restaurant in the parks for you. Warning: I moved a reservation from one day to another and the kosher food request did not transfer. I did, however, get a free dessert ticket for all of us (the pre-packaged Mickey Mouse ears ice cream around the parks is kosher) and a “fastpass” to cut the line. Totally worth it. Lines were up to two hours at some rides that day! There is no kosher food (beyond the typical pre-packaged sodas, et al.) at any of the other parks for which I am aware. However, Orlando parks do actually strive to not give you a hard time – despite signs at various parks, we had no trouble anywhere bringing our own food in. During yeshiva break week there are also sometimes more kosher options at some hotel or another or a food truck at the Chabad. 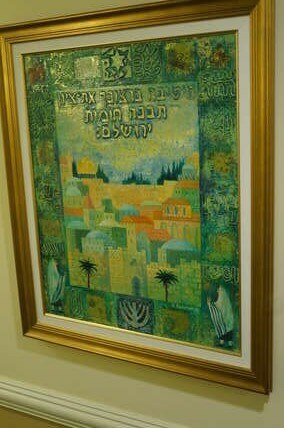 There’s also one restaurant – http://koshergourmet.biz/ but I have not been there to tell you about it. The restaurant next to the Chabad’s old location lost it’s hashgocha. I have no further information on this. It is certified by the Orlando Vaad which is recognized by the CRC. See the first paragraph of ‘Where to Stay’ above. The nod to Jews in the “It’s a Small World” ride. Further, you can usually catch a minchah/maariv minyan in Disney parks. Someone has apparently been reading my blog because on my post of five years ago, I told how three of us with yarmulkes were in the same place at Epcot and we decided on a time and place for minchah and every frum Jew we saw (man or woman) we told about the minyan and so it spread. We had about 50 people show up for minyan based on that! During yeshiva break week, there’s no shortage of Jews for a minyan at the parks. This past time, sure enough others were doing same and I heard from every Jew I passed “5:40pm in Mexico for minchah/maariv”. Until someone comes out with a “minyan app” to start these electronically (maybe it’s a security problem?) just use this word of mouth option to start or promulgate a minyan at Disney. It works really well! Go during yeshiva break week (late January). Your kosher food options are much greater and, as above, you won’t have a hard time finding a mincha/maariv minyan. Another benefit: January is the slowest month for Orlando tourism. The rest of the country gets off from school in late December and then not again until mid-February. In January, it’s a bunch of Jews and Europeans (including some Jews we heard speaking French) in Orlando. The lines are also shortest. Random outbursts of song – just like the movies. Walt Disney World – Your number one choice is Magic Kingdom. This is the epitome of theme parks. It is the best in the world and people come from all over the world. It’s Disney’s first and main park with the iconic castle. I find reading about it’s construction (you’re actually on the second floor above tunnels) and design (vacuum cleaner garbage cans) and thoughts about everything (point only with two fingers because some cultures consider one finger rude) to be the most fascinating part. They really strive to make you happy. If a child drops and ice cream cone, they replace it free of charge. If they mess up your kosher meal, they give you free food tickets … and in my case, a “Fastpass” to cut the line. They want no one to leave unhappy, no matter the cost. You will not find a crack in the pavement anywhere and everything is bright and immaculate. It’s also huge. I’ve never been able to do the whole park in one day. (Some of that has to do with the long lines, but…). 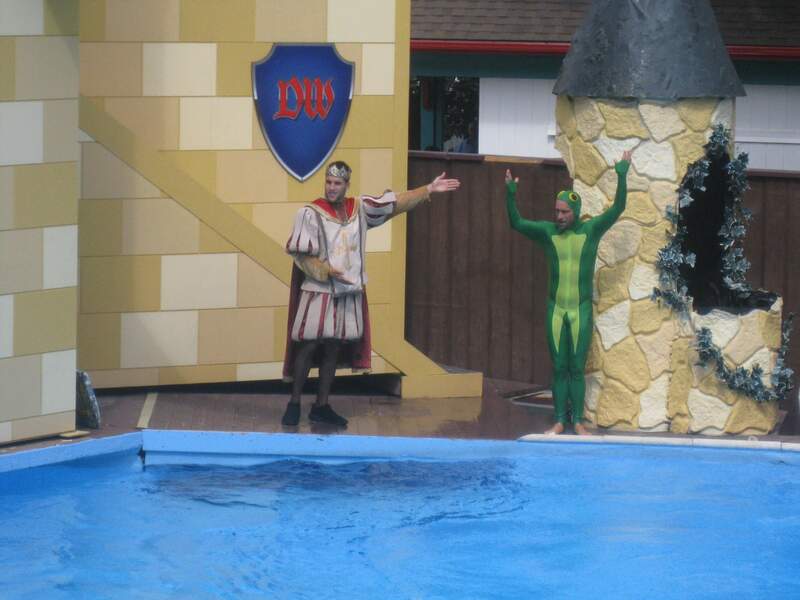 There are live shows all over the place and the rides are just professional. There are flume rides and roller coaster rides all over, but there’s something just better about Splash Mountain and Space Mountain – there are no jerky movements and everything flows. It’s best for ages 3-9 an then 30-90. Epcot Center – This is Disney’s #2 park meant to showcase new technology and worldwide cultures. I have to say it’s lost it’s luster for me. My favorite ride, Test Track, has been neutered. No more extreme heat and extreme cold and going fast into a door that only opens at the last second. I don’t know what they did to it. The fast outdoor part at the end is still good, but everything up until there … I’m just shaking my head. They’ve replaced a lot of the indoor amusement with very young kid things and I have some of those but it just wasn’t that appealing – I expect more out of Disney than put the right shape in the hole or spin the shape until it fits right. My 3 and 5 year old do more sophisticated things with our own building toys and computer games. Then the world showcase … well, my son ruined that for me when he pointed out that you go to Italy, Germany, Japan, wherever … it’s all restaurants and gift shops. Canada has a 9-screen movie advertising itself and there’s some live shows at the United States area (where the kosher food is, by the way) but eh. Hollywood Studios – Haven’t been there. This is on my list for the next trip instead of Epcot. Have a review of it? Please add it to the comments. Magic Kingdom Parade – that’s Merida who doesn’t turn into a bear. Characters are also at the Disney World theme parks … my sons don’t really care but one of my daughter’s does to an extent. You wait on line so they can meet the character. Some mother’s make a religion out of it with their daughters … they know where every character is and when and have an autograph book where they collect as many autographs as possible. My daughter’s best friend doesn’t even let her watch princess movies! One of the aquariums at SeaWorld. Universal Studios – I loved it twenty years ago. This was my first time back since then. Eh. I did the entire park with one of my daughter’s after the rest of my family went back to the swimming pool (thank you Uber). It’s broken up into sections by movie which is sort of problematic because my kids don’t know many of the movies and some of them are really dated … Men in Black … ugh. Some are just stupid … they took out the stunt show and put in a physical game show where they catch squid and dare people to eat sheratzim. Why? That’s better than a stunt show? I come to a movie studio for explosives and you took that away from me! There’s not even a studio tour anymore and Nickelodeon Studios is completely gone for some guys pained in blue with no entertainment there the entire day when it’s just dead space. Line to the Harry Potter ride. My kids wanted to see Harry Potter world so we went there first. At first, it is really amazing … you walk through a wall and there’s the entire set of the Harry Potter movies. Then you realize it’s all just traif restaurants and over-priced gift shops – $50 for a thin little plastic wand. I’m waiting for mine to come from Malaysia for $3 off Ebay. There’s one … count it … one ride in Harry Potter world. It was a good ride, I’ll give it that … just very short. They take you from one large screen to the next in your roller coaster thing. The rides in general are really good – they really are. The problem is that you only need to go on about two of them. After that, they’re just variations of the same … mostly some type of individual coaster through movie scenes except this one is on rails, that one is held from above, this one can spin, that one can spit water at you. My favorites were probably the Mummy (neat effect with the roof being engulfed in fire) and Harry Potter (more neat fire effects – maybe I just like fire and explosions). The ET ride had the best line – it’s pretty dark and you’re between redwood trees, but it’s not clear to me which rides they decide to keep and which they decide to update. ET is incredibly out of date with a video intro by Steven Speilberg about how great the ride’s technology is … they type your name in and ET speaks it out at the end of the ride … it’s so 1990. I showed the movie to my daughter once we returned home so she got it. Other rides, they changed out. They changed Back to the Future for the Simpsons?! That was their best ride! It’s now corny as anything with not a memorable thing about it. It was far from canonical making me further cringe. (The ride outside, the “non-threatening time waster” that spins around in circles was cute.) Clearly they did not realize what a big deal “Back to The Future Day” would be in 2015 (my birthday). My daughter got to “control the weather” at this show. They had a cute Curious George section for the real young kids where you walk through as you read pages of the book. Otherwise, if the trip is for your kids, I’d say skip this park. Most frum kids, and for that matter, many non-frum kids won’t know most of these movies and the park is just not staying in the present. It’s an answer to Disney for older kids, but Disney has this way of making movies and entertainment which much better stand the test of time. Gatorworld – I didn’t make it here, but it was on our short list. It’s far less expensive than the big parks but probably also only a half-day activity. You see alligators and stuff like that I think. Kennedy Space Center – I went on my last trip. Don’t bother unless you have a child really interested in seeing space shuttle history and that sort of thing. Nasa isn’t doing the kind of interesting cutting edge stuff they used to be doing either. Medieval Times – I loved this as a kid. I’m not sure how kosher this is, but they do serve pre-packaged kosher food. It’s a live jousting show with a lot of different teams. 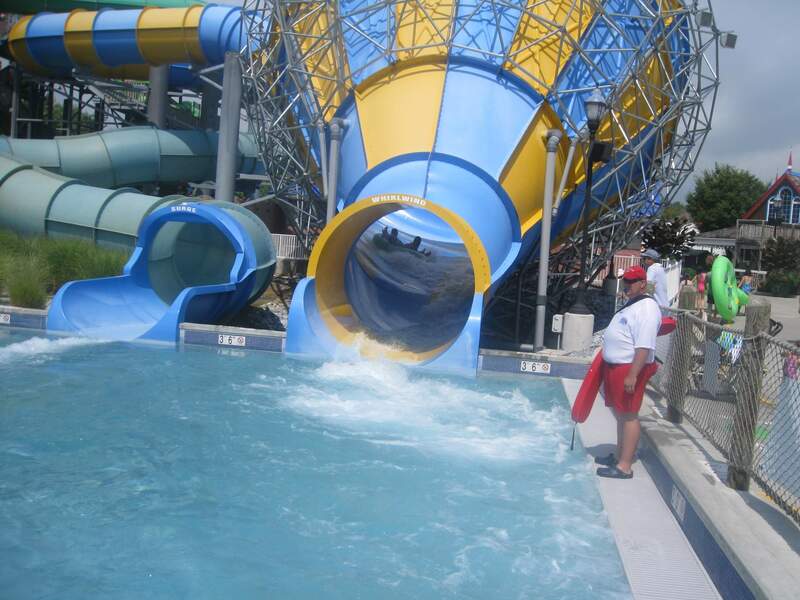 Legoland – This was on our list but was quickly cut. It didn’t get such good reviews and was largely described as being like any other smallish amusement park with the same rides, just Lego-themed. My kids liked the private house with heated pool best. I wasted a whole lot of money on tickets! Our next vacation: a house with a private pool anywhere in the United States and I take day trips only with the kids who want to come with me. The house and Magic Kingdom were the biggest hits this trip. On our last trip, Seaworld probably impressed us most. When you go during yeshiva week break, you’ll find plenty of frum Jews, more kosher food and minyan options, and shorter lines. If you read this whole article – sorry about my Universal Studios rant. Comments are appreciated. Please also feel free to use this as a point on the internet to discuss the topic in general. A few years ago, there was only one answer to this question – get a hotel room. You know, more or less, what you’re getting. If it’s a Hilton or Holiday Inn or even just a single local hotel, you can figure out roughly what they have to offer and expect to get that more or less. Does it have a pool? Does it have breakfast where you can find kosher fruit, cereal, and milk? If you wanted to find a house or apartment to rent instead, that would be an ordeal. You could look at a five line ad in a newspaper (remember those?) or the equivalent on Craigslist or even websites where you can see some pictures … but you’d have no idea if you were dealing with an honest person, whether you’d find bed bugs or termites, or if you’d ever see your security deposit back . . . and it used to be very expensive. We once ended up in a former warehouse converted into a tiny house and were expected to stay in the back room only. It was an experience. New websites have changed all this. We’ve now had experience with both airbnb.com and vrbo.com / homeaway.com and our next booking in the United States or Israel is much more likely to be with them rather than a hotel. Here’s why plain and simple: You get a whole lot more for the same price and have a whole lot more detail about what you’re getting. Plus, you get pictures of every room, details of the amenities, reviews from others with detailed comments, and know what to expect from top to bottom. and Here are three actual examples. Orlando, Florida – the first time we went circa. 2009 or family was smaller and we stayed at The Westgate Palace. Don’t get me wrong, this place is very, very nice. They give you a two bedroom suite with kitchen for, when all is said and done with taxes and fees, about $160/night. There’s an outdoor pool … fairly shallow, but very big. It’s also very close to Universal Studios and Seaworld as well as the Chabad 1.5 miles away with minyan. On our more recent trip, even this wasn’t going to cut it. We’d need two hotel rooms and still be cramped plus have to exit one hotel room and enter another to check on the kids. So we’re talking $320/night and have to deal with crankiness over the arrangement … from us or the kids. So instead, we looked into house rentals. It’s not what it used to be. We rented this house which I’m happy to share publicly and tell everyone to do it because it was so great. Or, even go to the owner’s website – Florida Gold. For more-or-less the same price as a single hotel room even if your security deposit isn’t returned you get a whole house. For even just two people traveling this a better deal! We’re talking five bedrooms with most of the kids upstairs away from the two master bedrooms downstairs and a heated pool. On our first trip to Orlando in January, we used the pool once … after that, it was too cold. On our most recent trip the kids literally wanted to leave the parks early to go swimming. It’s $100/ticket/person at Disney parks, and the nice house for which we paid half price for is upstaging Disney for all except one daughter who loves princesses and said the house tied with Magic Kingdom. in addition to having a private (heated) pool, which solves tznious issues in a major way, the house rental websites have started an arms race. You can find houses with game rooms – pool table, shuffle puck, foos ball. 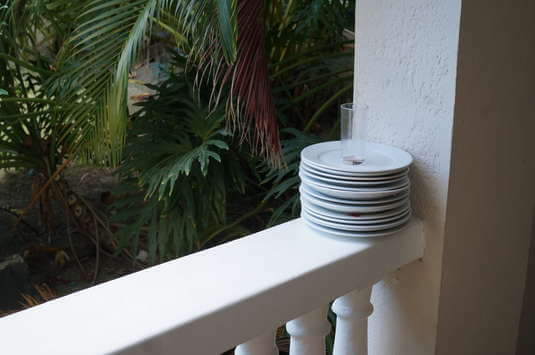 On top of this, your own washer/dryer, your own kitchen fully stocked (we kashered the oven and microwave), and in our case, complete with high chair, umbrellas, beach chairs, towels, soap, strollers, and more than I would ever even remember to think about. 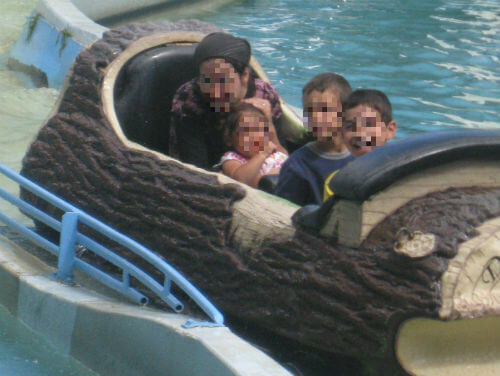 There were only two downsides: 1) location – the area with the minyan and parks are about 30 minute drive away to the North and we wouldn’t stay there for Shabbos; 2) as mentioned above, my kids didn’t want to stay at the parks which I paid a whole lot more money for. Modiin, Israel – Here, we used airbnb. Hotels simply aren’t near residential areas here and that’s okay … so instead we found a room in someone’s house. It’s not nearly as fun as having the whole house to yourself and you have to, you know … be social with strangers in their house. Like Orlando, again, the price was cheaper than a hotel. Unlike Orlando, this was about location. Zoom in on the map and find the location where you want to be (in this case, near relatives) and then look at the closest options, prices, and availability. With such rentals your geographic options are much improved over zoning ordinances limiting locations of hotels. New York City – You cannot, practically speaking, find a hotel room in Manhattan less than $400/night. The taxes and expenses there are simply too high. My German business colleague (he handles my patent filings in Europe), meanwhile, was in the New York City for a conference. He found a room for $80/night just off Wall Street in lower Manhattan – we meet at Reserve Cut and each pay about that much for our two courses of appetizers we order for dinner. Thus, if you’re like me, you embrace what technology has to offer you for the good. Smartphones brought taxi rides from anywhere to anywhere, apps telling us the nearest minyan and kosher food on our way, and places to stay anywhere for a whole lot less than a corporation can charge. Those who can provide the best service and most information prevail and that is what this blog is all about, besides – fostering the exchange of this information for the kosher traveler. It has further helped me immensely in business. Search for New York Patent Attorney or variants thereof on the internet sometime. P.S. I don’t own a smartphone. How do you do pay attention to life when you have one of those in your pocket? P.P.S. One more tip: If you find a house you like, go to images.google.com and search to see if you can find the image on another website – you might find the same house advertised for a different price elsewhere. I also saved about 40% on a bathroom vanity this way. What’s a Live Room Escape Game? Looking for a kosher, fun, adult activity? The ‘room escape’ genre started as puzzle-type video games. Very large maps with puzzles to solve actually had their beginning with text adventure games, followed by graphical games where you entered text commands, followed by more point-and-click type games. Then with the internet and “flash games” allowing easy programming and distribution of smaller-type games, puzzle games were placed in “smaller” settings. Instead of escaping an island, a mad man’s castle, or traveling through time to play three different time lines with three character which effect each other, the cut scenes and different settings are removed and the game is reduced to puzzles within a single room. (Extra points given to the person who can identify each game I referenced.) The typical “room escape” computer game (a very large list sorted by rating is here: http://jayisgames.com/tag/escape/rating) has you look at one of four walls and solve puzzles. Then, someone got the bright idea – why don’t we do this “for real”? My wife dragged me to the first one where I didn’t really know what it was. Now we’ve been to three different such rooms. They’re a lot of fun. Unlike the less than social video game versions, the live games are meant to be played as a team. In some places, you bring the team – minimum of two. In other places, the room or rooms are larger and if you don’t bring a large group, they have you join with strangers so the groups are about 6 to 10 in size. It’s great for a couple or a family with older kids (minimum age is usually 12 or 16). Post high school / college aged kids are often seen at these places as well, as well as younger adults. Having a larger group can be helpful as the puzzles can be very difficult. Sometimes the puzzles intuitive, sometimes they’re just strange. For example, a puzzle might require you to put dipsticks in holes and see what number aligns with the top for a code, you unlock a drawer with the code and find a radio. You use another code to figure out the station to tune to which then gives you yet another code. Or, in another case, you figure out that symbols tell you the position of coordinates on a map which point to a country. That country then has pictures which tell you something else only one of the pictures is of Greece, but that’s not one of your choices. Turns out it has to do with the actor in the picture who’s from Australia (a well known probable anti-semite which made the puzzle easy for me, and again, extra points if you tell me who I’m talking about in the comments). 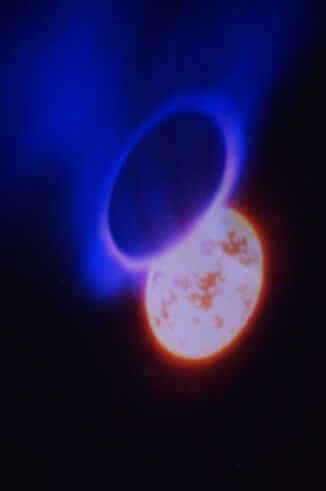 Use of polarizing lenses, ultraviolet light, erasers or transparency overlaps, and that sort of thing also seem to be fairly common. We’ve found the games vary in quality and types of puzzles depending on the place you go and who’s putting the game together. We liked some better than others. Our favorite so far was “The Remedy” where you search for your way out of a doctor’s office to find a cure. The puzzles where intuitive, varied, and required both the skill sets of myself and my wife. Different ways of looking at things help solve different puzzles (e.g. my analytic patent attorney way vs. my wife’s … I don’t know … she does this for a living … it’s something different than analytic, but I don’t have the skill set to describe it). By working together, we were able to get through all of the puzzles but got stuck juts before the end. Why? Mis-communication. I thought my wife already used a code, she thought I used it, etc, etc. Another time (with a different room escape), we sat down all but ready to give up and I tried a code on a lock and it turned out we skipped half the puzzles and got to the end in a way we shouldn’t have been able to … that one wasn’t so well designed. In “The Senator’s Manor” we joined a larger group in what was a fairly large space. This allowed people to split up and the alpha males not to step on each other’s toes. Sometimes, the others found things and others times you have to take the initiative. This was just fine with me and I had a lot of fun (between the inevitable periods of frustration that they games bring), but that’s because I’m one of those alpha males who did everything. My wife wasn’t as happy here, so therefore, I wasn’t as happy here. Still, I think a variety can be nice … sometimes go with your spouse, sometimes go with others too and form a larger group, go with friends, etc. The escape room games usually are one hour games. Including introduction time (5 to 15 minutes) and “decompression” afterwards, you can expect to spend about 1.5 hrs. That might not seem long, but when you’re “on” and alert for the entire time, it’s quite sufficient. The games usually cost about $30 – $35 per person. It’s worth a try at least once to see if you like it. You can find them throughout the country – Montclair, NJ has two such places at the time of this writing, New York City has one or two, Orlando has at least four . . . just type into Google “Room Escape” or “Adventure Room” or the like. Enjoy. Please add your comments below. In this article, more details about a trip to the Lifestyle resort with kosher restaurant and synagogue will be explored. If you haven’t read the first article, you probably should go over there now and read it. [Click any image to enlarge.] 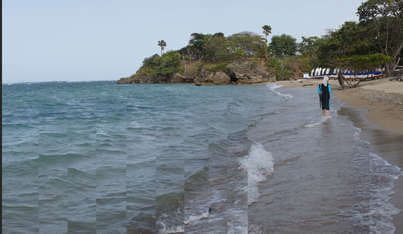 The resort breaks up its beaches into fairly deep and narrow strips. 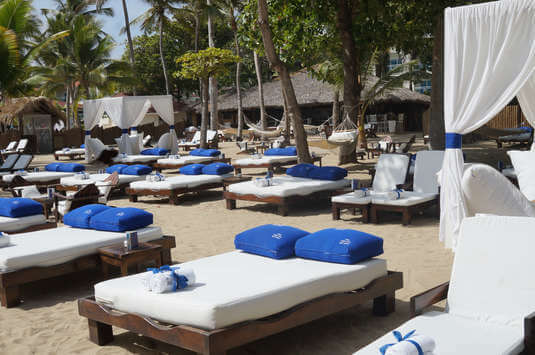 Depending on the beach, there are various beds with mattresses, canopies, hammocks, swings, and so forth on the beaches along with a bar and non-kosher food at almost every beach. (More on the bars in the below section.) There’s no way of getting around this issue: tznious [modesty] is an issue at the entire resort including even in the kosher restaurant. Even the synagogue itself has windows along both sides, though it’s away from most foot traffic. Back to the beaches – we never found them empty but the VIP beaches were usually less crowded and in the morning there were few people on the beaches, and by about 4pm they began to clear out again. The pictures on the right were taken about 10:30 in the morning … if you look closely, you’ll see the one person I covered up, but as you can see, it was mostly empty. No one at all was in the water in this section (NV Beach) so we had some nice swimming. Serenity beach was the same way, except much, much wider so there was room to be alone there as well. Most of the people who were at the beach tended to hang out by the bar. 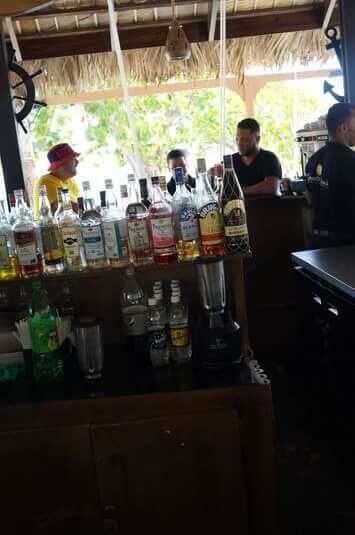 If you want a drink, you can also go to the bar … or staff comes to you. Pools also ubiquitous at the resort. If you want a private pool, rent a house. If you want your own time in a public pool for reasons of modesty … again, morning hours or late afternoon is best. If there are people in one pool, you can simply find one of many other pools by walking around. 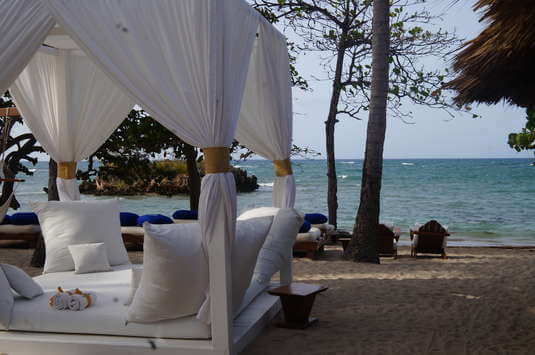 Many also have cabanas where you can have privacy. 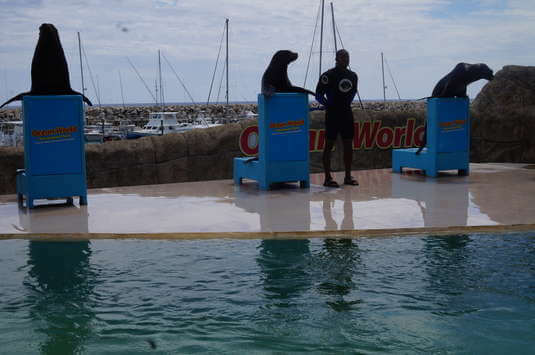 About a ten minute walk away is “Ocean World” which is owned by the same group. It’s included with your “VIP bracelet” ($25/person) and it’s sort of like a minature SeaWorld without the killer whales which hasn’t been attacked by lawyers and government over regulation. 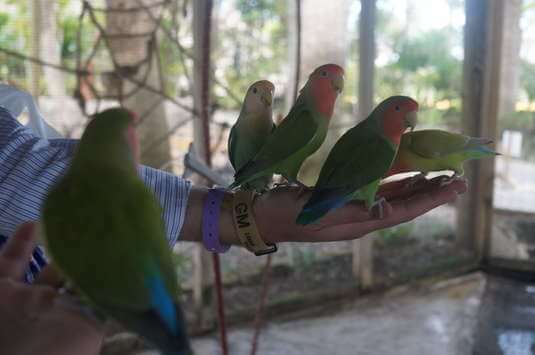 You can go snorkeling in their artificial reef (equipment cleaned with Listerine between each use), go in the parakeet cage and have the birds swarm all over you, watch animals shows, and for $10 extra, go down their water slides. The place isn’t so large, but again, very friendly and you can have a great time. It’s maybe about a 3 to 6 hour activity. After our next trip, I fully intend to expand this section. However, as we found out most excursions run midweek and you need to reserve the day before. If you’re going to spend a whole week, go Sunday to Sunday. If you’re going to spend part of a week, go Sunday to Thursday. For obvious reasons, Shabbos isn’t an option and on Sunday a whole lot less is available to do outside the resort. In fact, many of the excursions are Tuesday, Wednesday, and/or Thursday only. First, find yourself a reliable taxi driver. Sometimes you can find one just outside the entrance to the resort or you can use the tourist directory in a drawer under the Gideon’s bible next to your bed. For about $60/day, they’ll take you wherever you want to go. 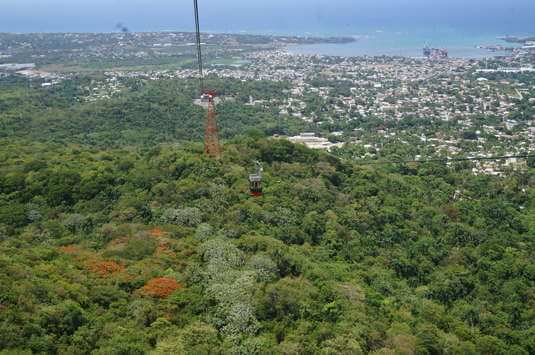 This might include the fortress (if you’ve seen one fortress, you’ve seen them all), the rum factory ($4 for a 750 ml bottle), and of course, the cable car to the top of the mountain. [Again, click on pictures for a larger view.] You can get a ‘city tour’ for not much more, but most of the time is spent taking you to gift shops while you wait for an American tourist to ask how much every little idol costs, all of them being within 10% of each other while having no idea how to bargain. On that note, Larimar is a rock found only on the island and is used to make jewellery if you want to find something nice from the island. 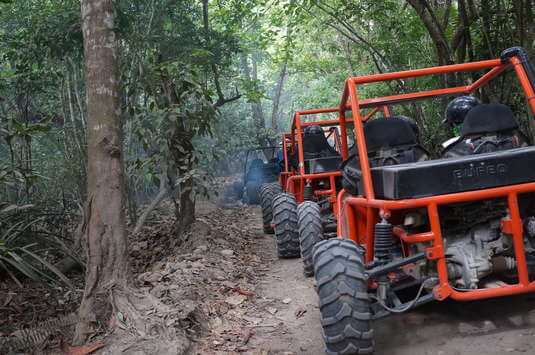 Other more adventurous excursions include horse back riding, swimming and hiking at the 27 waterfalls (Las Cascadas de Damajagua), and ATV riding. 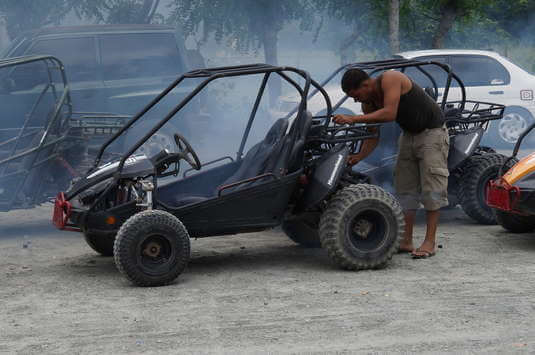 The ATV is best for one reason – you leave the tourist area and go riding in rural areas where you see how actual people live. While there are plenty of “middle class” houses, out in the rural areas we passed many shacks like the ones to the right. 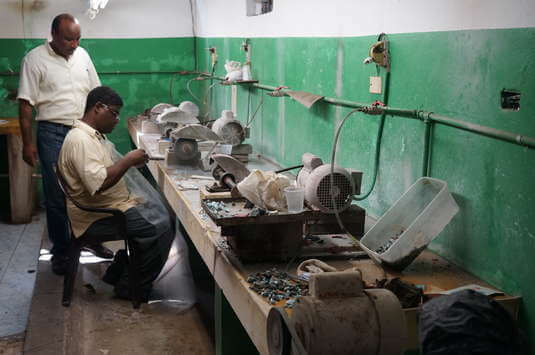 Incomes in unskilled workers are about $6/day! 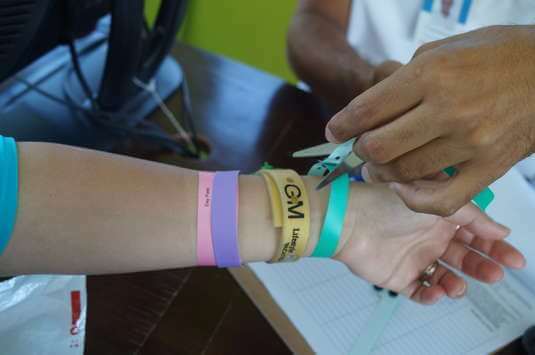 It is highly recommended to get the VIP wrist band. 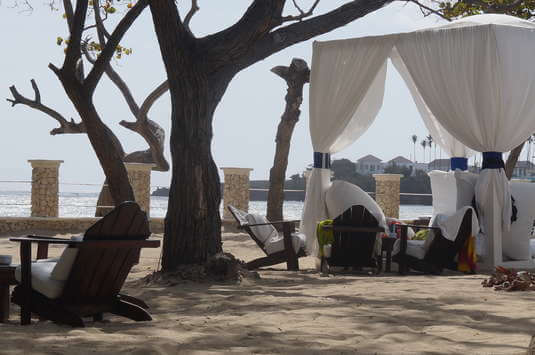 The lifestyle resorts have many different classes of visitors. At the lowest end were the locals who rented rooms in the not so nice section of the resort for $30/night to fill up space during the down season when we were there. At the highest level are those who own property at the resort. Somewhere in between are the “members” and guests of those members. Different classes of people get different wrist bands. My wife managed to collect four on one wrist. Make sure you have a VIP wrist band. 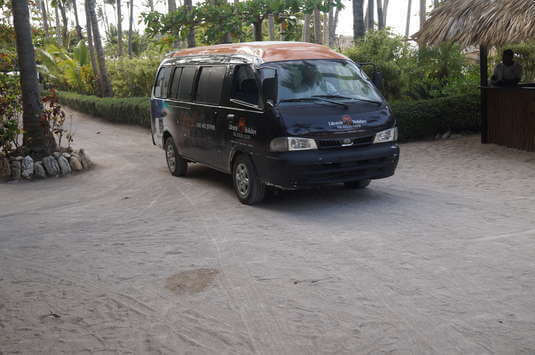 This gets you: a) pick-up / drop-off from the airport at no extra charge, b) shuttles around the resort, c) access to the nicer, more private, and more secluded beaches which are a must to mitigate the tznious problems in such a place, d) more respect from the staff. My wife won the band collection – pink: Ocean World; purple: kosher food; gold: VIP guest @ Lifestyle Resorts; blue/green: slides @ Ocean World. 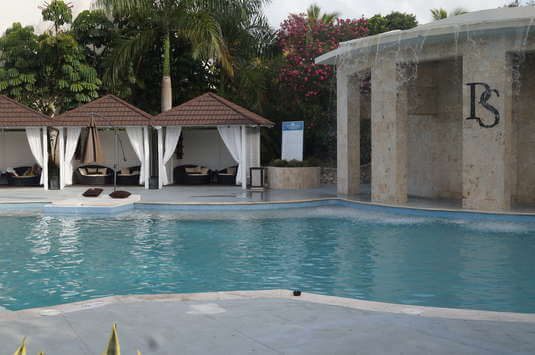 One of the houses @ LIfestyle Resort, Peurto Plata. Many are available for rent very inexpensively. One warning / the worst part of our trip – the have guys who work on commission who try to sell you “membership.” If you want it and you’re into that sort of thing (pay fees for cheaper room rates in the future), go for it. Otherwise, they act just like timeshare salesmen with free “gifts” and gimmicks to get you to pay. When you check in, they ask you to choose free bottles of alcohol. Then they tell you “okay, go pick it up at the ‘VIP’ building.” Then there are the overly friendly staff with khaki button down shirts and Indiana Jones hats . . . one offered us a “free tour” to welcome us. The tour took us directly to the building in question where he sat us down in front of a screen and said, “fill out this form so I can get my commission.” We walked out as soon as we realized what the “free tour” really was. Side note – this same guy gave me us a ride later in his golf cart. I didn’t realize it was him. I tipped him a dollar for the ride … it seemed like the right thing to do. Workers manually lift each gate. They get paid about $6/day and appreciate tips. Our recommendation – come with a stack of dollar bills and give one to everyone who provides good service. They appreciate it and it’s a kiddush Hashem (I think). 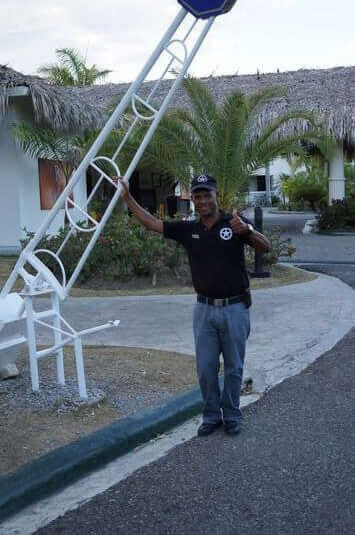 A worker at this resort makes about $6/day or less than $200/mo. Most workers I spoke to (after asking me if I was from Israel … I was way back, but…) were traditional, meaning they value marriage and have children. It’s very difficult for them to live on this salary. Seriously, rather than a key card entry system or some other form of electronic gate and cameras that we see in the United States, there are fifty different gates manned at all times by a guy whose job it is to manually raise and lower it. The guy in the picture smiled for me as he’s required to do, but that could be his son in the shack eating mango on the street. In “ocean world” it was like this with the workers … “the resort says $30 if you want your picture with a lion or macaw [glance to see if anyone is looking] … or just come with me and I’ll take your picture.” Right next to them was a conspicuous tip box with a $5 bill … we saw this same box and same $5 in it multiple times. The only place where they will actually outright ask you for a tip is at the airport with the baggage handlers. the pile mysteriously grows. Housekeeping leaves a bit to be desired . . . This is one area which leaves something to be desired. 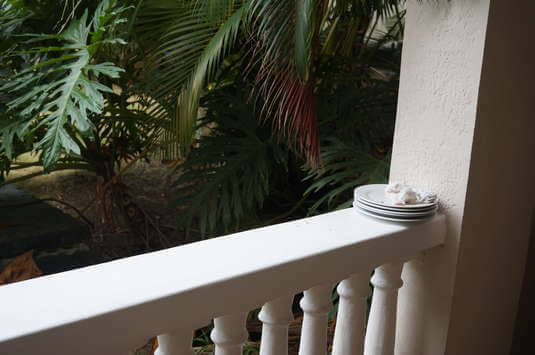 Outside our room were three plates when we got there … a few days later, it was about 15 plates and a glass. We just watched the pile grow. 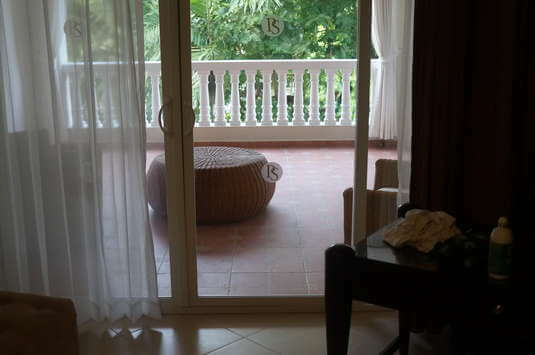 In our room, they have this strict towel policy (towels are great for bartering with in the Caribbean . . . a relative of mine once got a nice wrist watch in exchange for a cruise ship towel). We had to fight to get our towels returned after the first day and then only got some of them. The jets in our tub didn’t work and the people at the table next to us told us how theirs shot across about a 6′ expanse, over the night table, and soaked their bed. Our air conditioner leaked destroying part of the ceiling tiles. To their credit, they did come and fix the leak right away … but didn’t fix our jets. 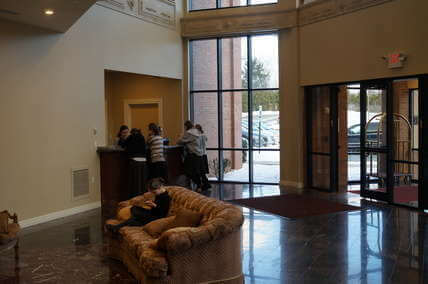 We also heard stories about the front desk hanging up on people and ignoring all complaints made. Here’s a total breakdown – Airfare: $600/person + $25/bag from New York. Hotel room: $110 – $140/night for rooms that hold between 2-6 people. Kosher food: $150/day ($75/day child). Safe: $3/day. Alcohol at all bars: included. Transportation: included. VIP usage: $25/person. Onside beaches, sports courts (including tennis racket usage), entertainment, and Ocean World: included. 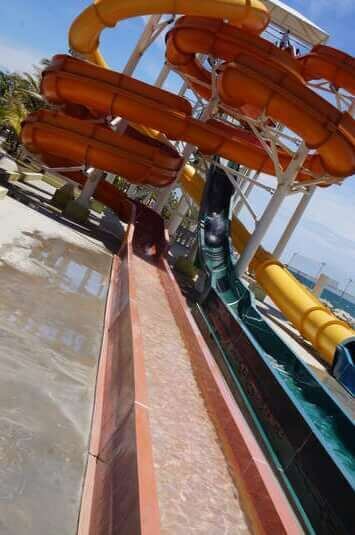 Water slides at Ocean World: $10/person. Tipping: <$35. This section is obviously subjective to our experience. First, according to the Rabbi, most who go are Sephardic, and more specifically, Bukharian. Since they raised the price, the percentage has switched to more Ashkenazi. Make of that what you will. Second, tznious is a huge issue. The frum Jews who go tend to be ‘to the left’ for this reason. The Rabbi told me of some of his own relatives who won’t visit him there any more, took off their glasses while there, and used side paths. (The use of side paths is relatively easy in many places, e.g. to avoid the pool area when going from your room to the kosher restaurant and synagogue.) When on transportation, you can also sit in the front row … the mode of dress there is pretty immodest. However, at other times, such as in the busy “Tropical Lobby” where excursions leave from, it’s impossible to avoid. We did our best to mitigate the issue. 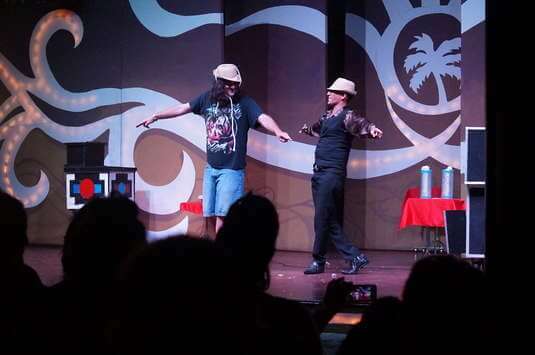 The resort has nightly entertainment. 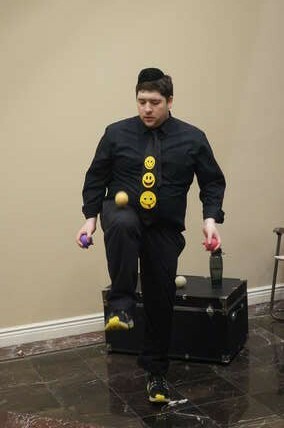 The only “kosher entertainment” according to the Rabbi is the magic show. Other entertainment includes a “VIP party” – there were literally women standing in high heels and white dresses (some actually fairly tznious) on white pedestals. As people walked in, they got their pictures with women on either side of them. No comment. On the other hand, everyone was very respectful and very relaxed. There’s no anti-semitism and most tourists, whether Jewish, hispanic, or you know… plain old white guy, seemed to be from New Jersey. If anyone thought anything of my wife’s tznious bathing suit and hair covering, no one said a thing and we felt quite comfortable. The bottom line is if you want a “proper” vacation which includes: a) three kosher meals a day of a quality where you wouldn’t be ashamed to invite your non yet kosher relative, b) a synagogue, c) a plethora of fun out door activities, there aren’t many choices. This is one of those choices and is one which we will probably revisit. 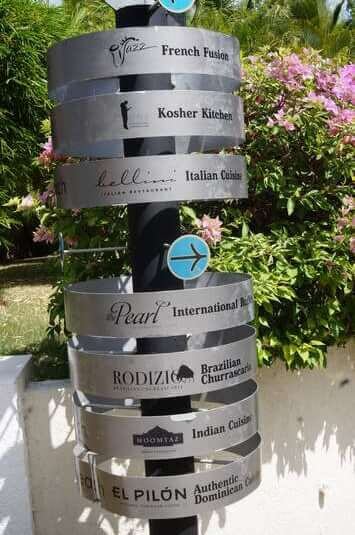 Peurto Plata airport departure area – Jewish settlement pictures in Sosua. 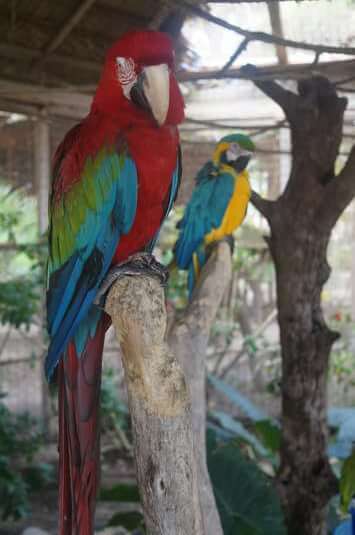 The island of Hispanola, which today holds the countries of Haiti and the Dominican Republic, was inhabited by the Taino people before their discovery by Christopher Columbus. The first Jews to step foot on the island were probably the known morranos on Columbus’s voyage followed by those with the Spanish conquest of the island. The last “pure” Taino people lasted until the mid-1800s, having died out in massive numbers due to disease brought by the Europeans. Tainos regularly mixed with the Spanish (who didn’t come with their own wives) and a small percentage of these Spaniards were Jews or known descendent of Spanish Jews. 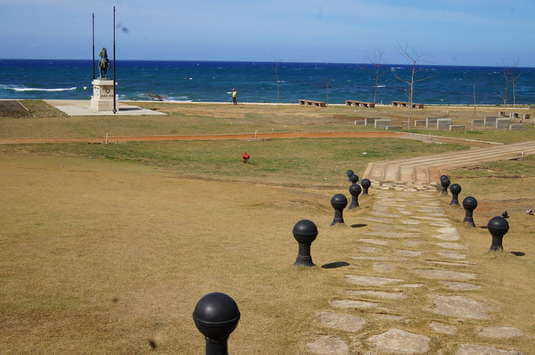 One of the Dominican Republic’s leaders in the early 20th century was descended from such Jews and a small congregation of Jews, once numbering about 1000, still exists in Santo Domingo, the capital. Today, this congregation advertises “traditional services without a mechitza” but is supplemented by a Chabad. Peurto Plata airport departure area – Jewish immigration plaque. 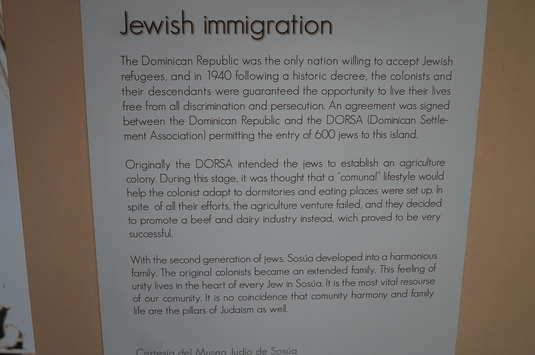 In more modern times, the Jewish population of the Dominican Republic was supplemented by German Jewish WWII refugees. While the rest of the world closest their borders to immigration during the depression era, Rafael Trujillo, dictator of the Dominican Republic, welcomed up to 100,000 Jews. He offered freedom of religion, low interest loans, property, livestock, and assistance to any Jew who would settle on the island. While his reasons for doing so may have had something to do with his hatred of Haitians and a desire to “whiten” his own population, the fact is that the island became a safe haven for the 600 to 800 Jews who were able to settle there. It seems among those who could leave and had the foresight to do so, they went to Israel even with closed borders. Still, some Jews made it and while many moved to Miami with a better economy in subsequent years, there’s a still a population and synagogue (now primarily a museum, unfortunately) in Sosua where Trujillo created a Jewish community. 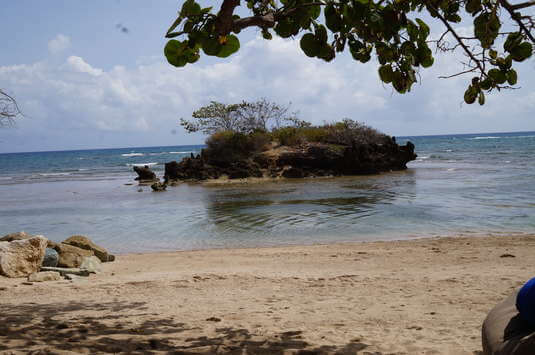 Sosua is just miles from the Puerto Plata airport and as such, it is fitting that a kosher vacation spot exists in the same area. 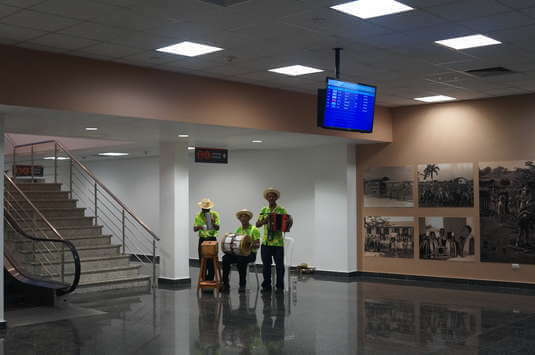 Peurto Plata airport departure area – the local band next to the pictures of Jewish immigrants. 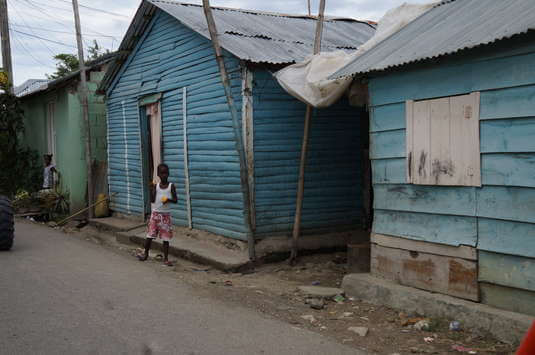 Today, the local tale is that while Haiti suffered a devastating earthquake, the DR was spared due to it’s welcoming of the Jews. 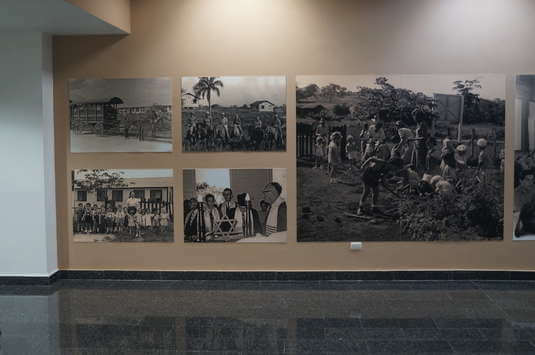 when you leave the Puerto Plata airport, a mural and information about the Jewish settlement of Sosua greets every passenger. The Dominicans seem proud of this and not only did we encounter no anti-Semitism on our trip, but rather we encountered respect with the frequent question, “Are you from Jerusalem?” or “Are you from Israel?” A security guard even had a short conversation with us in Hebrew! Most Dominicans are Catholic, and when Hugo Chavez (leader of Venezuela) made an anti-Semitic comment in 2013, the local head Catholic priest is known to have said that Chavez won’t live out the year. He was right. Lifestyle resorts is a huge corporation with multiple resorts in various countries. They don’t seem to maintain their intellectual property rights very well, so you can find numerous websites using some variation of the “LifeStyle” name offering packages. The resort in Puerto Plata is huge – you can rent (or buy) three to five bedroom houses, often for about $500/week or less if you look on house rental websites such as homeaway.com. Each house has it’s own private pool. Or you can rent hotel rooms or suites. There are various sections of the resort each with their own style and “hashpa” (general feeling or impression). The Presidential Suites and Crown Villa areas are among the most “up-scale” of rooms, away from much of the shtuss, and closest to the kosher restaurant and shul. The place to start is at the kosher website for Your Vacation Dreams, LLC. They are “members” of the Lifestyle resort – while you can book with the Lifestyle resort directly or through a variety of brokers, as a “guest of a member” your treated a whole lot better. There are many complaints by those who booked through “cheap carribean” or others around the internet. We also found prices ranging from $110/night to $600/night for the same thing! Your Vacation Dreams, LLC operates multiple websites geared towards different crowed, but their kosher website is very “matter of fact” and very accurate with numerous tips and recommendations about your trip. You don’t need to book through them – but we had an excellent experience doing so. Rooms range from about $110/night (single hotel room) to $365/night (7 bedroom house). Two bedroom suites are $125/night. Add to this $150/day for kosher food which is paid based on a Jewish calendar day … dinner and the following breakfast and lunch. (Technically, it does not include lunch the day you arrive/leave but you can sort of sneak this in if you’re there.) Children are $75/day. Thus, even with two people, the food is much more expensive than your hotel room. Having said that, the food ranges from “very good” to “excellent” and we were stuffed at all times. Considering they are importing most of their food from the United States (such as the meat) and Israel (the cholov yisroel dairy products) and serving some fancy meals, $50/meal is not actually all that much for what you’re getting and where you’re getting it. It’d cost you much more for comparable kosher food, say, at a nice restaurant in Teaneck, NJ. Chicken costs them $9/pound and there’s a full-time Rabbi/maschgiach. 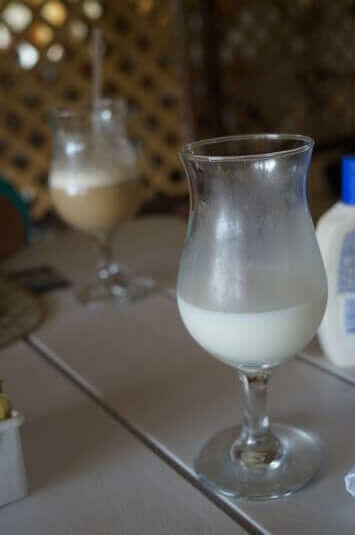 An interesting side note – the Rabbi supervises the cow milking locally and then boils the milk himself. 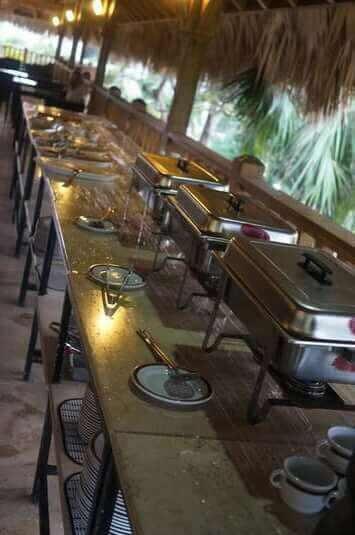 The food ranges from “Ashkenazi” to “local Dominican” and there is a very big concern that the food be good. It was. More on this later, but let’s get the basics down first. When there are not a lot of people there, they put dividers in the kosher section and label it “private party.” When there are enough people, they actually take over the whole restaurant, and sometimes two restaurants. The restaurant is certified by the O-K (use the link to check if this is still the case before you go). 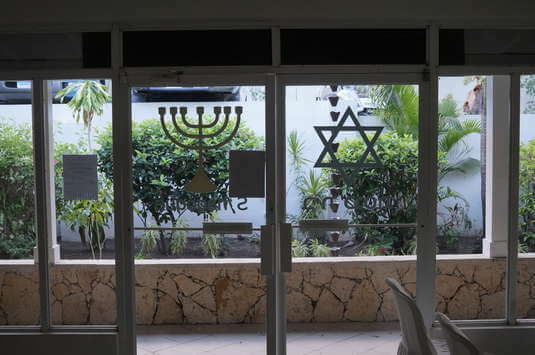 The shul (synagogue) in Puerto Plata. 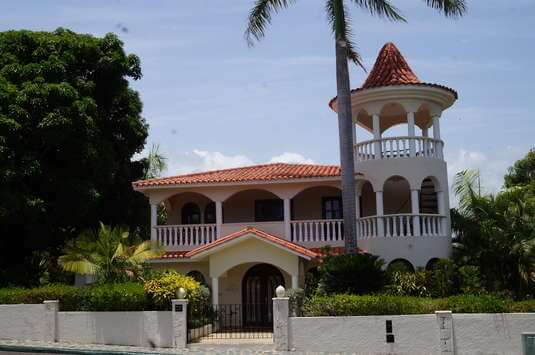 According to the Rabbi, a Lubovitcher who works for the Circle-K Syrian Jew was renting large numbers of rooms in Puerto Plata and started demanding a kosher kitchen. 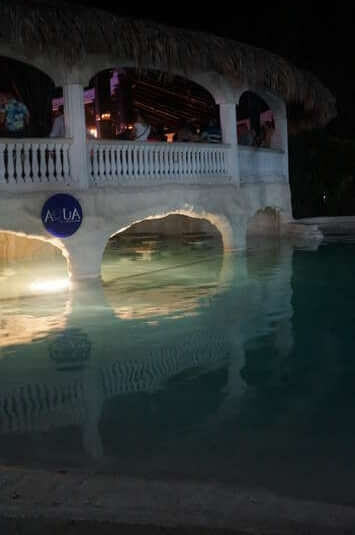 The resort administration was happy with this arrangement and welcomes Jews to the resort to whom they want to sell properties and investments. However, the renter wasn’t so good on bill payment so the administration did some research to find proper kosher certification in hopes of creating a full time kosher kitchen. They found the Circle-K who was interested, but also asked that they set aside space for a synagogue. 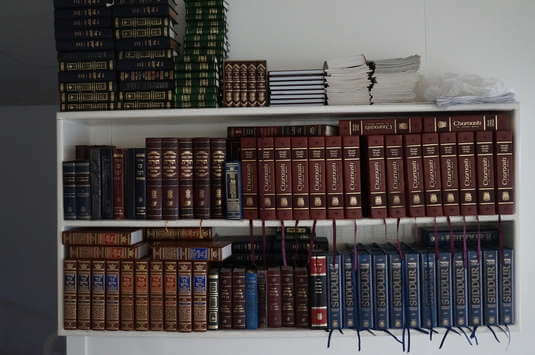 Seforim (books) in the shul (synagogue) in Puerto Plata. This synagogue can hold about 100 people but a minyan is not guaranteed. We went during a down time in the Jewish calendar and there was no minyan. Actually, there were more curious non-Jews than Jews Shabbos morning and there is no program during Pesach. However, if you want to come during yeshiva week break, that fills up about 9 months in advance, capped at 215 participants (they had 340 one year and decided that was too many). 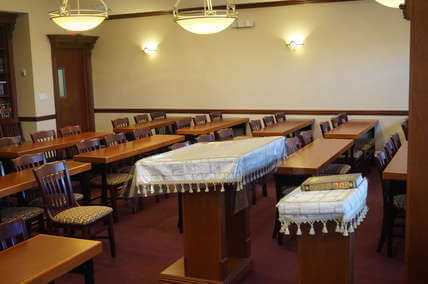 The synagogue has various siddurim and chumushim as well as a rented sefer Torah and mechitzah. 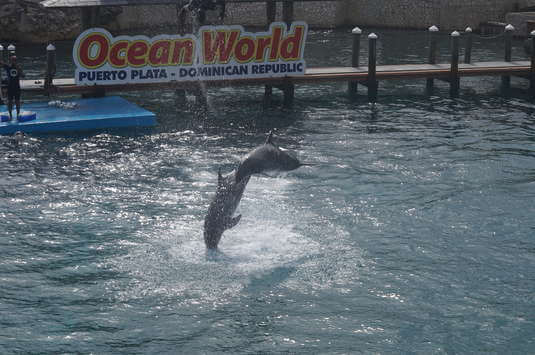 The resort has many of it’s own beaches, a smaller version of “SeaWorld” called “Ocean World” and there’s a lot more to know. Click here to go on to part II of this article. 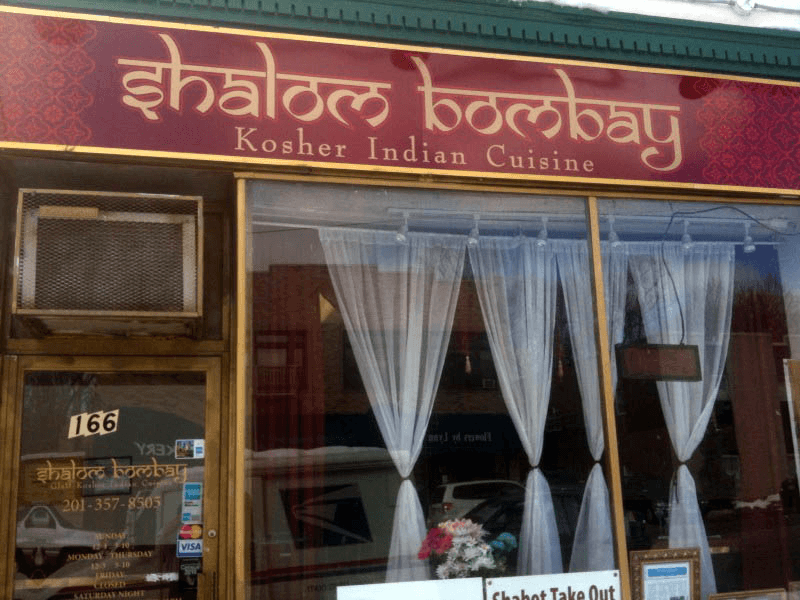 You can find kosher restaurants in most cities with sizable Torah observant Jewish populations, but Teaneck is so large it can boast two different strips of kosher restaurants and shops – one along Cedar Lane, and another along Queen Anne’s Rd. 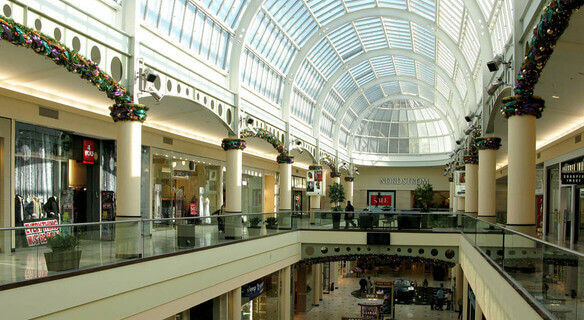 Both are not far from Route 4 where you can find much additional shopping, including the large malls of Paramus, NJ (closed on Sunday). The Jewish community of Teaneck (and Bergenfield, where the community has spilled over into) is known for being a bastion of “Modern Orthodoxy”. It also includes plenty of less than Torah observant Jews along with more “yeshivish” Jews with many yeshivas and some very large synagogues. Situated about 5 miles from the George Washington Bridge, it is not far from New York City. This review is not intended to complete. First, it is limited to restaurants which have been in business for some time, so as not to include restaurants which are likely to disappear just as quickly as they appeared. Margins are often thin, expenses are high, and you don’t need a degree to open a restaurant. However, running a good restaurant is a challenge, even without the different set of business challenges and benefits of being a kosher restaurant. There are also restaurants I simply haven’t been to or won’t discuss for reasons of “loshon hora” (speaking badly about something, and in this case, potentially harming someone’s business). Your comments are welcome. I am judging in the following categories: food, price, decor, hours, and service. If the restaurant is closed at odd times, it gets knocked down. If the service is slow, rude, or immodestly dressed, it also gets knocked down. My judgment is based on my own subjective experience with comments of how it compares to the “traif” variety. I came into Torah observance later in life and have plenty of experience with all sorts of “traif” restaurants. Price will tend to be higher for kosher places (kosher food costs more in many cases) as there is often an extra staff member required to oversee the food preparation at all times. The food, unfortunately, is known to be not as good but that is changing rapidly with, for one, the influx of people like me who are used to better quality, and for two, the maturing of the kosher market with every greater diversity and competition in a growing market. The difference between the quality in Teaneck restaurants now and even ten years ago is amazing. As far as I am aware, all the restaurants are certified by the RCBC, the kashrus for Bergen County, New Jersey. Check their website before you go to make sure that still holds true. Each restaurant is linked to it’s own website as well. Legend: “(C)” refers to the Cedar Lane strip, at about the 400-500 range on Cedar Lane. “(Q)” refers to the Queen Anne Rd strip, and side streets at about 1400 Queen Anne Rd. Two restaurants fall into this category – ETC Steakhouse and Nobo Wine and Grill. They are right across the street from each other. These are both “upscale” and hoity and/or toity places. The waiters wear suit or suit-like things. The primary dish is … steak. The secondary dish is … another kind of steak. You can also get fish. Nobo (C) has it’s own parking lot on a long narrow stretch of land, as is the free-standing building that houses the restaurant. In the winter, they somehow have a fresh flower on each table and the waitresses dress somewhat-but-not-really up to Jewish modesty standards while seeming to have been properly trained and are professional. Service is also pretty quick considering they’re cooking you a 10 or 20 oz steak. The food is excellent. The salads are amazing and fresh, the soup is amazing, and they have a large pepper grinder for fresh pepper as well as little rolls with separate bread plates and olive oil. It’s very much up to traif standards. I give the food rating not because the steaks are that much better than traif (they’re about the same) but because the accouterments are so much better than average. Price … it’s about $65/person with an appetizer, main course, and tip. This doesn’t cover dessert. This place is not cheap, but compared to it’s counterparts in Manhattan … it is. The portion sizes are also fairly sizable. Decor … it’s up against a train line on a very narrow strip of land. Thankfully, it doesn’t have anything so obnoxious as valet parking, as one would expect at many traif varieties of such a restaurant, but the whole building is narrow and a bit dark in there. Everything is black with dim lights. Still, comparing it to many of other kosher restaurants in Teaneck, it’s great. ETC Steakhouse (C) is a bit more boxy. The food is in smaller portions than Nobo, and it wasn’t as much to my taste. Still good, but lacks a parking lot hurting it in the “Decor” category compared to Nobo. The staff did not know what items were gluten free and what not (a dietary requirement of someone I was with who has Celiac disease), but still just as ‘fancy’ as Nobo. The food is still “better than traif” of it’s kind, but the portions are smaller causing it lose a star. Decor … no parking lot, though there is a large municipal one right next door. The hours of both places are strange. They are not open Sunday, despite what’s on their websites. They are not open Saturday night, which is prime time for going out in the winter for a Shabbos observant person. So they both get “-5”. You have to find a weekday night to go them, really. That means Monday – Thursday. That’s silly, though I understand a restaurant of this caliber being closer after Shabbos because it’s hard to have things fresh and up to your standards when you have to rush to open, using food from Friday. We’re not talking falafel and hummus, the Jewish stereotype. We’re talking Indian, Japanese, and Tex/Mex. In order, that’d be Shalom Bombay, Sushi Metsuyun, and Smokey Joe’s. Shalom Bombay (C) serves Indian food. The best Indian food I ever had was in Japan of all places (I’ve never been to India…) and this restaurant certainly is not up to what I’d expect from the traif variety, but is still “good”. The service is great, the decor is great, the spice variety is great … but the meat tends to be of a fattier variety and I’m spoiled by a mother who wrote a cookbook and growing up and deciding to make na’an (a kind of Indian bread) with me. Eating it here … it’s just not as fresh and meat tends to have a good deal of fat on it. Still, I’m being picky. I once helped arrange a networking event here with 30+ lawyers (mostly of the non-Jewish type) who thought it was very good. For someone who is used to all sorts of non-kosher Indian restaurants, you’ll think “this place is kind of good.” For someone who hasn’t experienced Indian cuisine before, I think you’ll really like it. It gets these ratings because, well, it is expensive and the food is good, but not amazing. The decor, in my opinion, is very much up to what I’d expect from a nice restaurant. It is also open every day for lunch and dinner, including after Shabbos in the winter. Sushi Metsuyun (Q) is … a sushi place, really. They have some other meat dishes and the like. I think it has improved in recent years and it’s certainly good. (I much prefer Kyo Sushi and Steakhouse in Monsey, NY, but this is a Teaneck article). The restaurant is part of a chain of a quite a few, of varying quality and decor. It appears they are independently run. It gets marked down in the “decor” department because it’s basically a store front with big glass window with seating for maybe 25. I’m usually not impressed with the waitress staff here, but this varies. Estihana gets honorable mention – it’s another sushi restaurant. 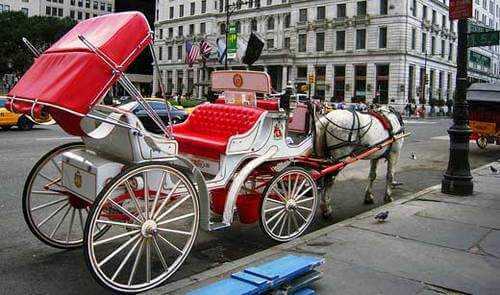 The variety in Manhattan is excellent and right next to the Metropolitan Museum of Art. I have not been to the newly opened location in Teaneck so I can’t rate it yet. Smokey Joe’s (C) has had conversations with me about how kosher restaurants get away with all sorts of quality issues that they shouldn’t. He knows his food and does all the “slow cooking” and marinating of meat and so forth that you’d find at a “Friday’s” or “Bennigan’s”. This restaurant has won various awards for it’s food and you see plenty of non-Jews eating here, despite the higher expense of kosher meat. This is a very good sign. On Saturday night’s in the winter, there is a band each week. This adds a cover charge and they aren’t always the most impressive bands, but well, it’s a valiant effort. When the place fills up, service does get slower and it’s sometimes hard to catch a waitor, but the food is generally very good and the owner cares. Say hello to Moca Bleu, Rabica, and Shelley’s. All three are dairy cafes. Moca Bleu (Q) (pronounced by my kids as, “makabul”) is the newest of the three, boasting on their menu their $5000+ bar mitzvah and bris catering packages. With a hot brick pizza over behind the counter, superb dessert/pastry counter, and wide variety of food served you can find something you like here. One of my kids loves the personal pizzas. They’re really quite good. Stay away from most of the appetizers … they’re mostly overpriced, small portioned, and not so great. The sushi is decent. The fish and chips lunch special I once ordered was excellent. The decor … that’s up to your taste. Some people hate the tin can metallic feel of the place, along with the very light clear plastic chairs. 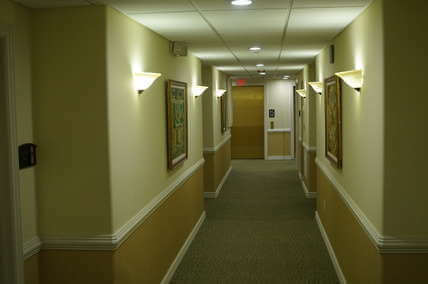 When it’s busy, you can’t hear a thing with the sounds bouncing off the walls and high ceiling with visible air ducts. The modesty level of the waitresses leaves a great deal to be desired, and as a Torah observant Jew can be uncomfortable. One time a waitress tried to tell me a 20% tip was the norm. If you are careful when you go and what you order, this place is often excellent, however. It also has many gluten free options. One note – it gets marked down on the “hours” category because we’ve gone sometimes to find it closed for private parties. Rabica (Q) had some pretty decent food. It’s right next to Sushi Metsuyun, having the same sort of “window shop” feel with a large glass window in front of a narrow room. This is even more narrow, having the counter take up much of the space. We liked the food, but it sure is on the tiny / claustrophobic side for a restaurant. If it were anywhere else but Teaneck, still, I’d have no complaints … I’d only be singing it’s praises for being a great kosher restaurant in Omaha, NE. It’s only because there’s so much else to compare it to that I can even find fault with this. Shelley’s (C) has been around forever. It has booths like a diner, only nicer and cleaner. The food has varied over the years, but they start you off with some bread and butter and have lots of pasta dishes, mainly. The same owner’s own “Noah’s Ark” across the street, a meat restaurant. I much prefer Shelley’s which I go back to from time to time. Dougies, Gotham Burger, and Noah’s Ark go here. My opinion of buying a hamburger at a kosher restaurant is … buy some chop meat at the supermarket and throw it on the grill. You’ll spent $5 – $10 per meal and it will be better. Dougies (C) is known for it’s subs as well as burgers. I don’t know … a proper submarine sandwich from a good privately run sub place of the traiff variety … that was something good. Dougies does not impress me in quality or taste. The restaurant is big. I’ll give it that. A lot of people seem to love this place, mostly of the “kid” variety. Gotham Burger (Q) … not my taste, but my kids thought it was amazing. In my view, it was a “bland fatty burger”. In my kids view .. as in all of them who can talk, it was “the best”. (Now, if you can get lamb burgers at Pomegranate in Brooklyn and grill them… that was the most amazing burger I ever tasted, beating any traiff burger I ever ate). Some of my kids seriously want this to be where I take them for their birthday present. I don’t get it. I guess I had my five year old birthday party at McDonalds so I’m not one to talk. 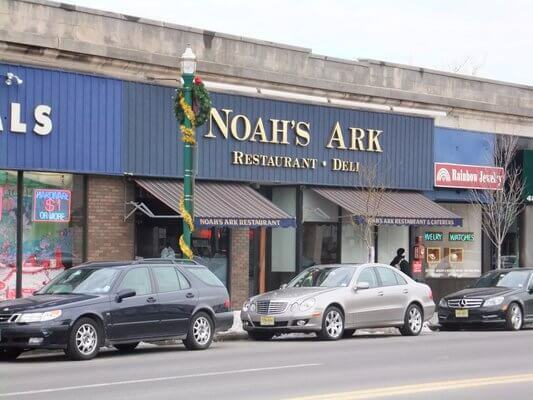 Noah’s Ark (C) has a lot of deli. It’s basic. I haven’t been there in years, so I won’t judge, but it’s also been around for years. There’s so much else in the area that I like better, so I don’t really know how it is these days. Again, you can find the addresses at the RCBC link and I encourage you to look there and make sure any place listed above is still actively open and kosher. (C) means it’s on Cedar Lane. (Q) means it’s on or within about one block of 1400 Queen Anne’s road. Much of my review is subjective, so if you have a different opinion or think I missed a great restaurant … add your comments below. The most popular article on this blog is about the now kosher Raleigh hotel in South Fallsburg, NY. Clearly, it’s something people are interested in, as the article is mostly found via search engines while my articles on philosophy … not so much. There is clearly a desire to find a hotel which lives up to the highest standards of amenities and halacha [Jewish law]. Mostly, one finds either exceedingly expensive Pesach programs, bed bugs, or just a “kosher friendly” place. There’s the exception with a bed and breakfast that is quite good, but I thought I would never find the, l’havdil, “holy grail” of a proper hotel for the Torah observant. Most such hotels, such as Kutschers and the Concord have closed and it seems to be a money losing proposition today. It still is, and that’s why, in all my searches for “kosher hotels” I haven’t this one. They simply don’t advertise themselves as a hotel, but wow. The story goes that a very wealthy ba’al tesuvah (who seems to have made his money on Russian oil) sponsored the entire hotel and conference center for Jewish outreach purposes. It is on the campus of, and operated by Ohr Somayach, a yeshiva for Jews who want to learn more about and/or are returning to Judaism. They have programs at this hotel / conference center along these lines, as well as for Torah observant families. For example, the “Shabbaton” program I attended was meant to be a family inspiring Shabbos with programs for the kids and shiurim [lectures] for the adults on child raising. I was just looking for a place to go away with the family, but started attending the shirium which were very good. The “hotel”, well, “family retreat center”, operates seemingly about every other month … so you can’t just go any time. They also rent out the space to others and use it for other types of programs. You have to look at their website to see when it’s available, but while it’s a really fancy hotel, their primary reason for existing is to teach Torah. It’s a very hard thing for someone with kids to get away for such a thing, so they take care of that too. The hotel is on the campus of Ohr Somayach, right of Rt. 306 in Monsey, NY. Some of the minyanim were in the main yeshiva building of Ohr Somayach, where I sat in my old seat, the seat where I first fumbled with tefillin many years prior during a brief period when I attended the yeshiva. I’m sure other readers, those who are both frum and looking for decent hotels, shared the same experience not many seats away from there. The hotel itself is modest in size, as far as hotels go. There are only about 30 (estimated) guest rooms with a two story lobby, elevator, and three staircases. Upon entering, you’re greeted with a fire place and some very European taste. To the left is a conference room or “library” and to the right is a rather large gym with a full court basketball court and locker rooms. Go the other direction, and you’ll come to the dining room which holds about 80 people. On the second and third floors you’ll find the guest rooms. The second floor is also houses the beis medrash / synagogue. 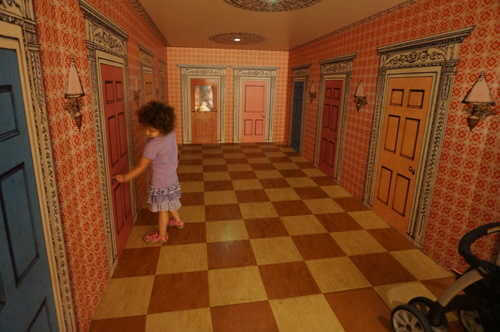 In the basement and rooms on the second floor, is a game room, childcare, and more childcare. When we first arrived, the bellboy insisted on loading our luggage onto a wheeled cart. I tried to stop him, preferring to have my kids do the wheeling, but he would have none of that. By the time I got inside, not very long after, my wife already had our room keys. We were up in room quicker than any other hotel that I can remember staying at, and everything was waiting for us. 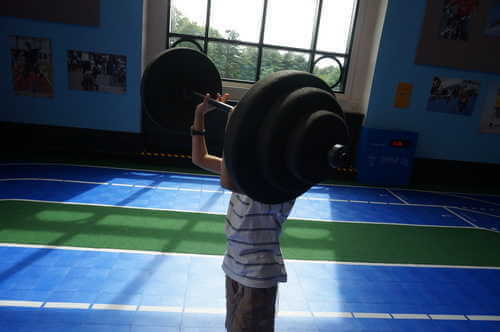 When I had registered, I was asked the ages of kids. I didn’t even have to think about asking for the right number of beds and cots, because it was all already in the room, complete with crib for the baby. Never, can I recall, has a hotel gotten it so right. I’m still astonished that this is a yeshiva where the emphasis is not on “gashmayos” … and to be clear, it’s still not. When the Rabbis spoke to me, they clearly much better appreciated answers having to do with what I learned while there, rather than my appreciation of the physical surroundings, which were meant as a tool for the former, despite my less than ideal first intentions when signing up for the weekend. We stayed in two joined rooms – the kids in one room with enough beds for each of them and enough room to walk around between them. Our room was a bit smaller, but still quite well sized. You could think you’re in a Hyatt Regency or Marriott . . . the layout is identical. The ceilings with stuccoed acoustic panels, slightly lower ceiling at the entrance way, and so forth is identical to the best of hotel blue prints. My wife and tried to move a dresser over to fit a bed where we wanted it … that thing was solid. The only thing “missing” was, of course, there’s no television, and while it was wired for phone service (I checked) there were no phones. Today, when everyone has cellular phones and I really don’t want to go to a hotel for my kids to watch TV, this was just fine. First comes the food. Then comes more food. Then there’s some more food. There’s a buffet when you arrive before Shabbos – mostly confections and some fruit. There’s the Friday night seudah – wine and meat. There’s the 10pm “tisch” complete with beer and wasabi almonds. There’s breakfast – cereal and cakes. There’s kiddush after davening – herring, cakes and salads. There’s the seudah by day. There’s afternoon snack foods. There’s seudas shlishi – various kinds of fish and salad. There’s melavah malaka – pastas, soups, and pizza. There’s Sunday breakfast – waffles from the waffle iron, cereal, cheeses, etc. There’s Sunday lunch – wraps. The food was very good and my stomach doesn’t take much to complain. When I don’t get sick at a place like this, that probably means no one else will either. At least when I was there, the Shabbos children’s program consisted of not much more than “hand’s off” babysitting. There was not a very organized program for the kids, and while my older kids said they had a good time, it’s a better place for younger kids between the ages of about 2.5 and 8 or so. 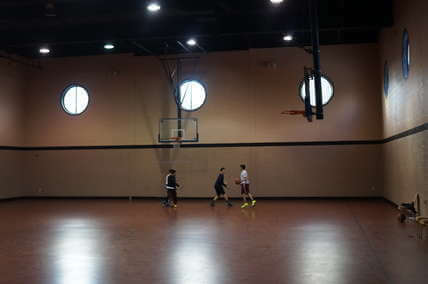 Below that, and really, you need to be with your baby and above that, there was one shiur for boys and they can play ball in the massive gym. Only on motzei Shabbos and Sunday were there “organized” programs including a juggler, a magician, cotton candy, story telling, singing, and team games, again geared towards about the 2.5 to 8 year old crowd. I should mention, since it’s not self-evident given the sort of hotel options that do exist with childcare – everything is in English. Update November 2015: I returned and the children’s program was much improved. They had organized activities like games of duck duck goose, projects, and walks to the playground. The babysitters were much more involved. As you may have read above and may have surmised from the travel part of the blog in general, I do like to travel and especially take my wife and kids to various destinations. This was no different – for me, this was one more destination to try. About halfway through Shabbos I finally let it sink in that the reason they have this hotel, isn’t for the “hotel” and the “I just want go to away, eat and do activities” crowd. They have to teach Torah. The lectures, in general, were very good and a worth attending. Monsey, NY is one of the largest Jewish communities in the world. This will be in a future article by itself, but suffice to say, you can find large Jewish bookstores (e.g. Tuvia’s), excellent kosher food (KYO Sushi and Steakhouse), and even entire Jewish shopping centers with kosher supermarkets (Shopper’s Haven and Evergreen), women’s clothing, and toy stores. Within ~10 miles you can find Harriman State Park for camping and shopping in both the Palisades Mall and Paramus, NJ malls (the latter are closed on Sunday). I may not write about too many more kosher hotel experiences on this blog simply because I found what I have been looking for. 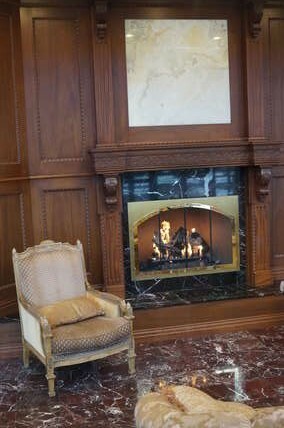 There are plenty of other articles I’ve been meaning to write on this blog, but if you’re looking for a proper kosher hotel experience where you can take the family, be in a Shabbos environment, be in a nice place, and have full minyanim and kosher food that doesn’t cost an arm and a leg, in the United States, this is what you’re looking for. Most of the price is also tax deductible as it’s a donation to a non-profit institution. 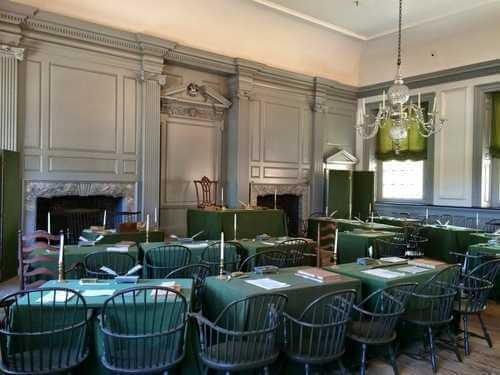 Philadelphia has quite a few places to visit with the family. 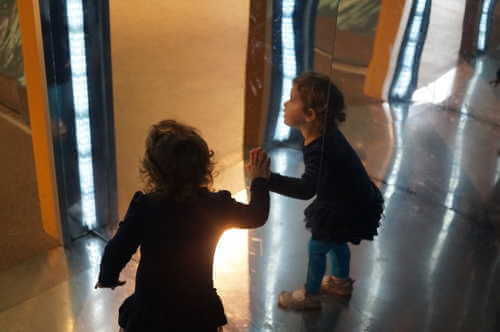 My favorites are the Franklin Institute and Please Touch museum. You can spend a day in each. As with many of the posts on this blog, this article is not comprehensive, but merely highlights the places I’ve visited. I welcome readers to add more information in the comments or even contribute your own articles. Just across the Delaware, the Jewish community of Cherry Hill also has a few kosher restaurants and two litvish shuls and a Chabad with regular minyanim. The vaad is currently called “Cherry K” which has a further list of kosher restaurants in both Cherry Hill and Philadelphia. In Cherry Hill, as far as restaurants go, you’ve got a meat place, a pizza/falafel place, and a bagel place. I’ve been to all three. Let’s just say the bagel place is very good – here’s a link to it on the map. The other benefit to Cherry Hill are the plethora of hotels just outside of Philadelphia, especially along Route 70, many of which back up onto a nice park. You can get everything from “America’s Best Value Inn” (and worst night’s sleep not in a tent) to the Crowne Plaza … and depending on when you go, the price difference is not that much. I stayed at the Crowne Plaza for about $120/night midweek. I’ve been going to this place since I was about six years old, thanks to a grandfather who loved science, me who loved sleepovers at my grandparents, and the close proximity to the museum. I’ve gone twice with my own kids and spent a day there without seeing and doing everything. We did not even need to pay for the “extras” like the Omnimax movie and the like. The full size train in the basement is still there, though it no longer moves. 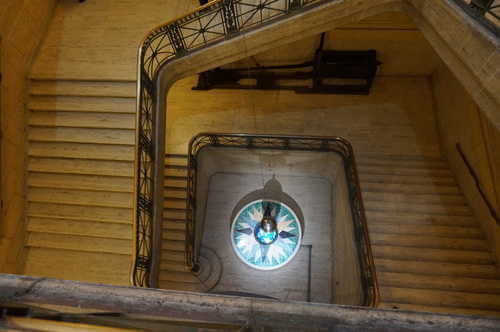 The pendulum spanning three flights of stairs is still there . . . and it still moves with the tilt of the earth. The heart that you can walk through, following the path of blood, is still there. A lot of everything else seems to have been updated, and it does have the obligatory “feel bad you evil human who is destroying the Earth” section that every natural history and science museum seems to require. I can do with less of that. Then there’s are great sections like the human body where they have live dissections, and shows with liquid nitrogen and hydrogen, and the electricity section which is great(, but nothing compares to this section at the Boston Science Museum). This ‘museum’ can be better be destroyed as a children’s play place on blown up to astronomical proportions. It started out in a two story storefront in downtown Philadelphia right next to the Franklin Institute (which turns out is now an art gallery owned by a Jewish man with four grown kids – make sure your GPS has the updated address, though he did give us kosher chocolate covered almonds, so…). The current location is massive, being the size of a museum. It’s got loads of play places including optical illusions, a fake weight room, instruments, ride on vehicles, a train set … it just goes on. You start in the center and go one direction or the other. At the end of that side, you go down the stairs and across the basement level … then back up to the other side of the first floor. 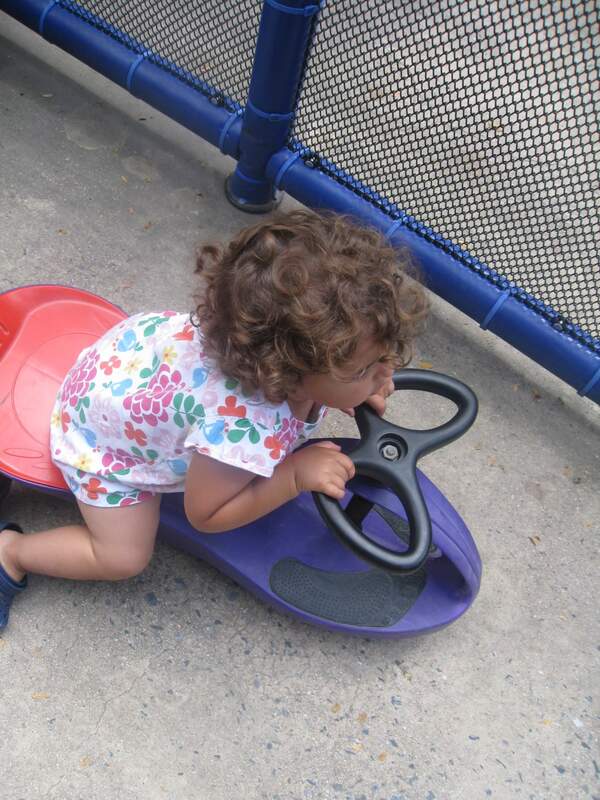 Like the Franklin Institute, your kids are more likely to tire before you can do everything in one day. My friend, Brian Silvey, wrote a whole article about it over here for this blog. I haven’t been there since I was about 12, but I remember it being a very nice zoo. 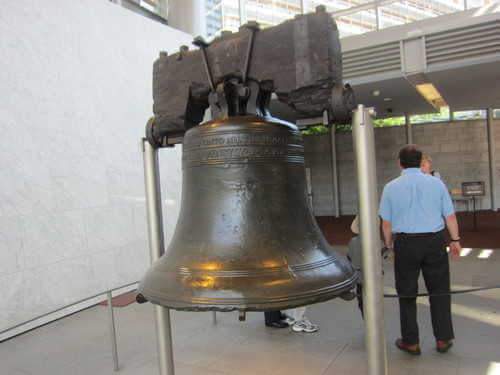 Here’s a picture of the Liberty Bell. You’re good. Move on. Independent Hall … well, they made it look like the painting with the dark green table clothes and high back chairs. 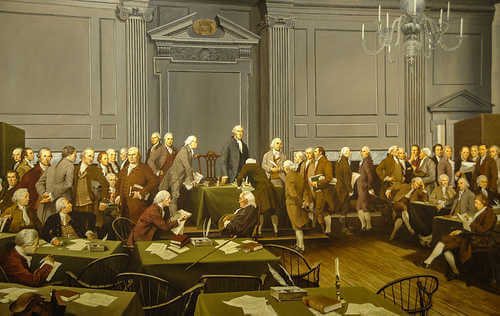 If, like me, you watched the movie, 1776 in school when the teacher didn’t feel like teaching that day, you get that, “wait, I’ve seen this somewhere before…” feeling when you see the staircase where Jefferson and Franklin sang their duet over who should draft the Declaration in the movie. Otherwise … here’s a picture, move on. Now for “The Museum of Jewish History” … from the perspective of … well, the museum took over an old TV station building. in their main gallery, they honor Barbra Streisand and Isaac Meyer Wise, move on. I have not visited and really don’t intend to do so any time soon. A religious friend of mine described it as a museum dedicated to the assimilationist experience, lauding mostly people who happen to have Jewish ancestry, but did nothing with it. Well this is arguably better than the only bigger Jewish museum in the U.S. that I know of, the Holocaust Museum in Washington (which I have visited twice) about how we died, this isn’t exactly a museum about what it means to not only happen to be Jewish, but about why we’re Jews in the first place. For that, we don’t find Judaism in a museum. We live the Torah and make it part of how we live our lives. 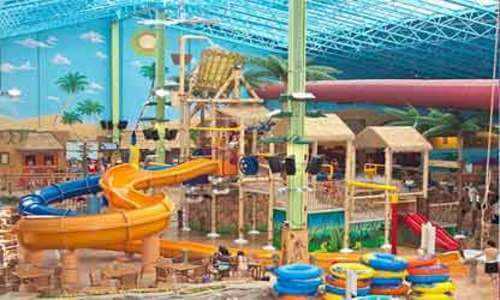 There’s an indoor water park in West Berlin, NJ about 20 miles outside of Philadelphia. It’s a place with some smaller slides, lazy river, and that sort of thing. Every Chol HaMoed they have a day split between men’s and women’s hours with a large Sukkah outside (which fills up at meal times). Jews from everywhere between Brooklyn and Baltimore are there, being about a two hour ride for each. I’ve been there twice and had very different experiences. One year, they had washing cups, proper tznious, it was packed, and there were long lines for food. Another year, no washing cups were to be found (but hey, you’re in water park … you can find a kli somewhere), the towels covering the windows weren’t doing such a good job, and the crowd was much, much smaller. One year they enforced no kids in the over-sized hot tub, another year no one said a thing. It’s worth going to at least once in your life. Lancaster, Pennsylvania as well as Harrisburg make for great vacation for younger children. Our family went when our oldest was about six years old, but there’s plenty to do for up to about maybe a 12 year old. 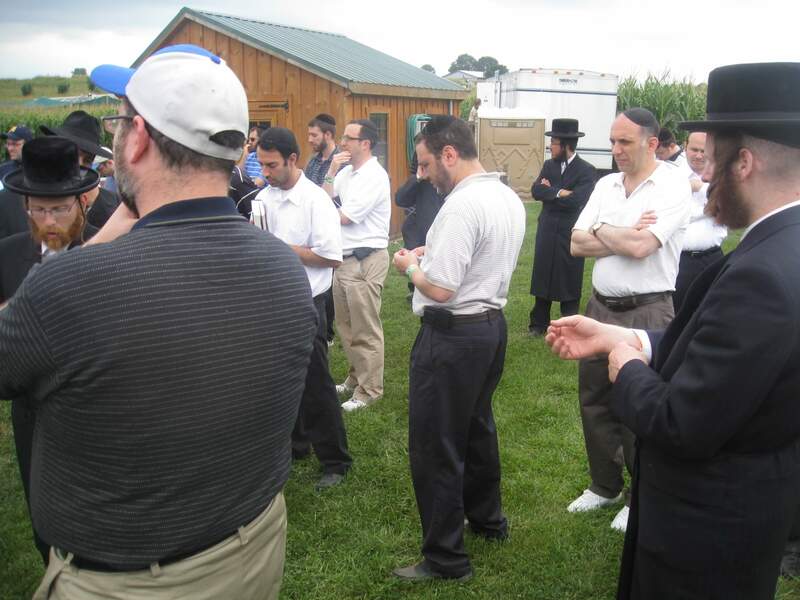 Further, the more rural Pennsylvanians tend to be polite, and the mix of Amish in the backdrop (and sometimes driving carriages on the road) with the influx of Torah Observant Jews each summer (in droves) makes for a generally very refined atmosphere. On the rural open roads, I also clocked my land-speed record, according to my GPS. For food, they have kosher food available at the park for sale. There used to be an entire restaurant, but it’s been reduced to pre-packaged foods available for pickup at another store. Hershey Park runs Chol HaMoed events each year where they open the roller coasters and the like. This is an “older kid” park, but still, plenty of rides for even small children. The best part by far, which is not open during Chol HaMoed, is the water park. Unfortunately, due to Jewish standards of modesty versus secular standards, it’s not an appropriate place for a Torah observant Jew to go. We happened to hit it first thing in the morning when it was supposed to thunder and lightning and went in as soon as they decided they were, in fact, going to open the water park that day. No one was there but us for a good while. (As a side note, I collect pictures of my car at the best parking spots, right in front of the gate. Nothing like getting there early … no lines and a longer time until the kids and adults get cranky.) Hershey Park, like Dutch Wonderland, is classier than most amusement parks I’ve been to and well designed. Since, as mentioned above, we were there early … there is a free Hersey advertisement ride right next to the park. You sit in a car-thing that drives you through singing cows and that sort of thing, and are then left off at a gift shop full of every imaginable Hershey product. It’s all kosher, too … if you don’t hold of Cholov Yisroel for chocolate. For food, the Hershey Kosher Mart has been operating for quite some time. It’s a fast food restaurant with burgers and that type of thing. For being the only kosher restaurant for miles and miles around, it’s certainly welcome and kids like it. 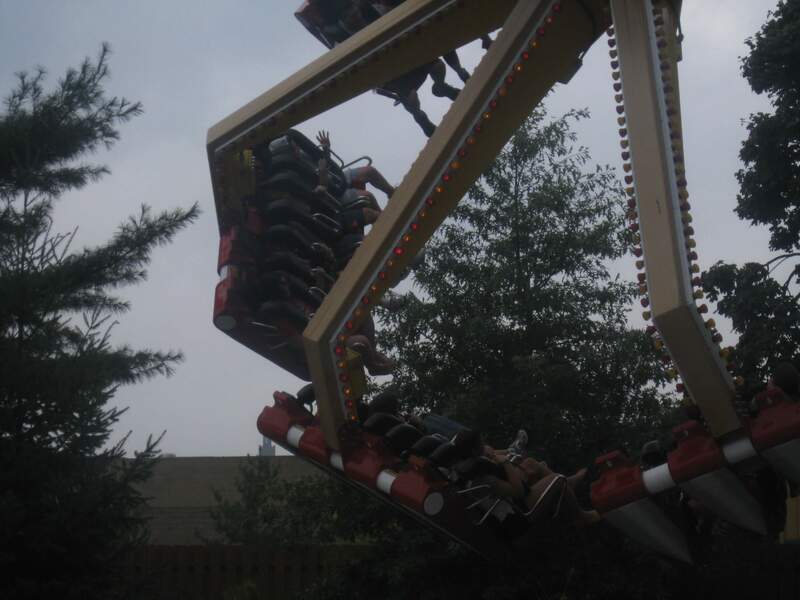 My wife and six year old went on this … I still can’t get them back on such rides years later. 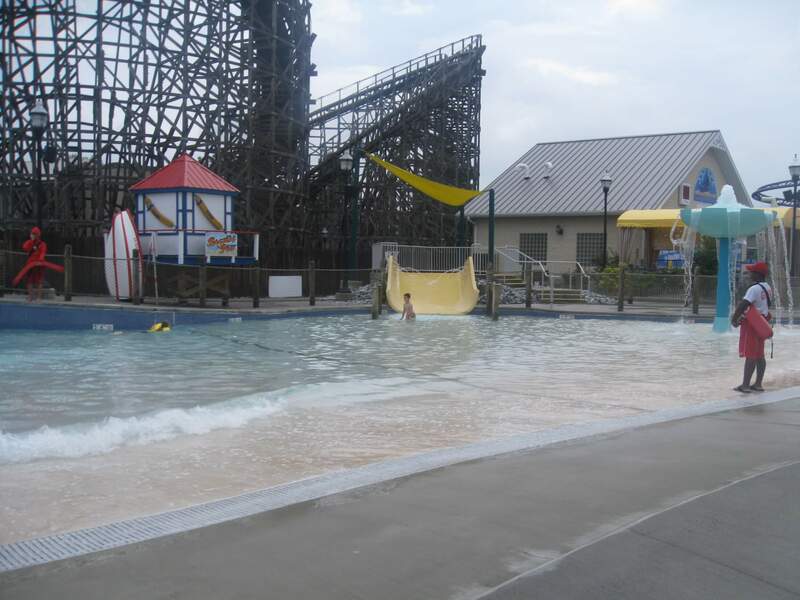 We got to the water park @ Hershey before people descended. This was both a fun and tiring day. 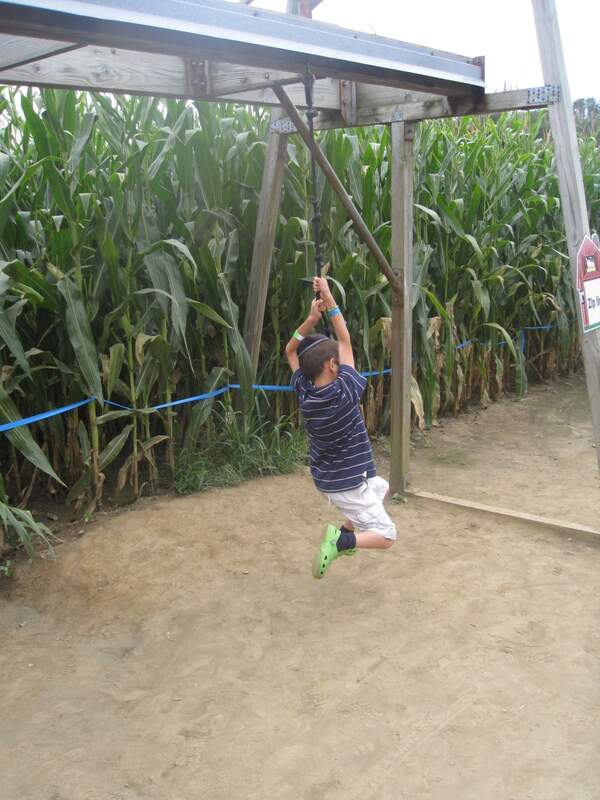 The amazing maize maze @ Cherry Crest Farms is the largest and best corn maze I’ve been to. (Okay, I’ve been to three in my life.) It’s huge and they change it every year, with different color coded sections and each party carrying a large flag on a pole so they can spot you and make sure you still have energy to find your way out. For those of us who played video games like this and wanted to experience the real life version of finding your way out of a huge maze, here’s your chance. One of the most striking things to me was when I went to buy tickets the lady at the counter said, “your prayer time is 2pm over here on the map” … and washing cups were at the sinks outside the basement. Not only was my “prayer time” at 2pm, but there about 80 people there, including one of my former Shabbos meal hosts from Jerusalem who had since moved to New York. 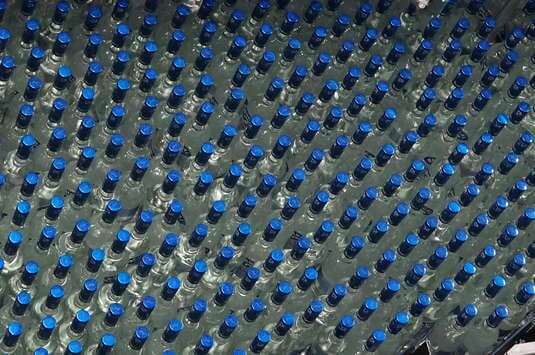 Much of the packaged food sold is also kosher. 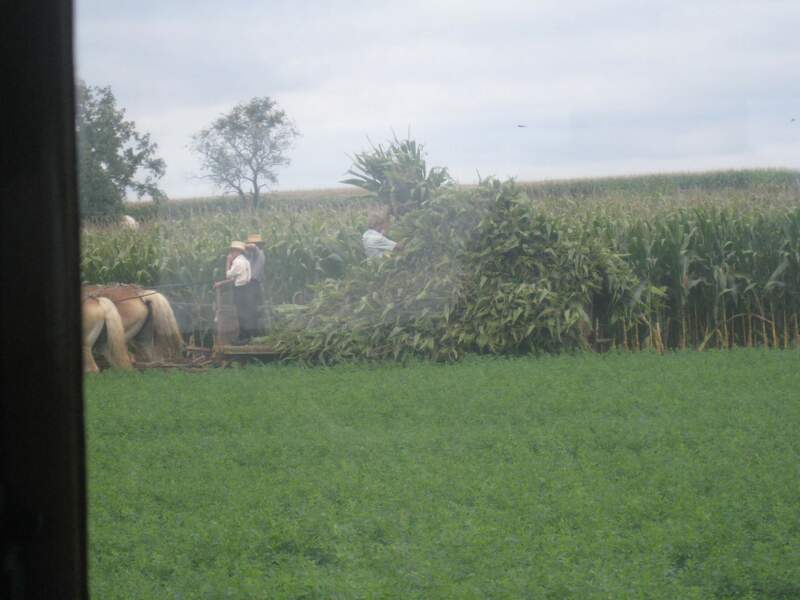 Also on site are some farm animals and small cart ride to the part of the family entertained that had enough of viewing identical looking corn stalks from all angles. As an adult, I enjoyed this ride. The kids loved it. It is, they claim, the only working steam railroad in the country. It’s not fast, but the train has … character. Nice cloth seats and thick wood. You can see similar trains at the New York City Subway museum, but these actually move. 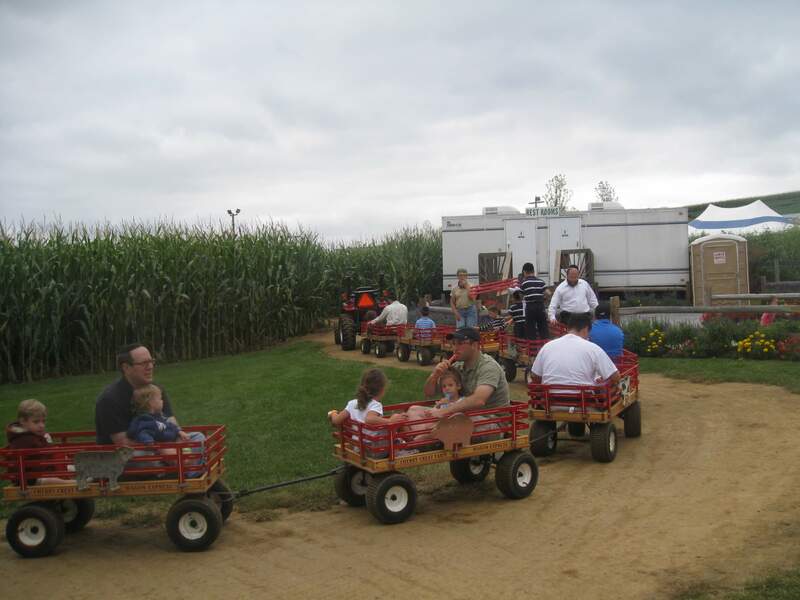 There are two stops: Strasburg and the corn maze (see above). On your way, you’ll path through farm after farm owned by the Amish. We were able to see husband and wife teams farming fairly close to the train. At Strasburg, they also have quite a large collection of trains in a large hanger (you pay separately for this versus the actual train ride). It’s interesting, but probably not worth more than about an hour’s time, if that, for most people. The train ride itself and watching the stream escape in a huge cloud is the more exciting, if not fairly restful, part and you can take it to the corn maze and back. We stayed in a no longer functioning bed-and-breakfast in Harrisburg, PA. We had two kosher meals a day, but alas, this is no more. 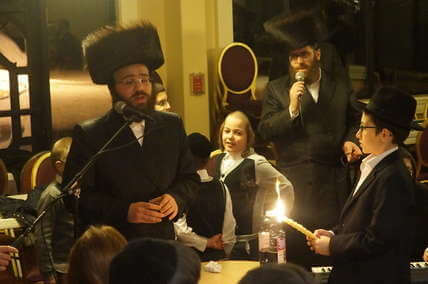 Still, if you stay in nearby Harrisburg, you can find regular minyanim at Kesher Israel synagogue as well as some minyanim in people’s homes in other areas of town, including at a Chabad run out of the Rabbi’s house. In Lancaster, you have Degel Israel Synagogue which does not seem to have a website, and we haven’t been there so we don’t much about it, but the PA Kosher Mart at Hershey Park has information about davening times and location on it’s website: Minyan times and locations in Lancaster. The Amish have a reproduction of the Mishkan. I drove past it but didn’t make it in. A friend who has visited told me that it’s mostly accurate. Then there are formal Amish tours. The same friend who did this thought it was great and learned a lot about the Amish way of life. If you have more things to do in the area, feel free to drop a note in the comments. On a side note, Ludwig Christophel Franciscus was a German immigrant to colonial Pennsylvania in 1710 and one of the founders of the Amish. His kids reported that, even when Amish, he didn’t eat pig. He also told his children he was Jewish and here’s the fun part … his descendants share a nearly identical are fairly rare Y-chromosome with me. That is (and I’m very roughly estimating here based on the data I have), about 10% of today’s Amish are probably my 10th cousins or less. This article is connected to our other article about the Rockville, Maryland Kosher Vacation. 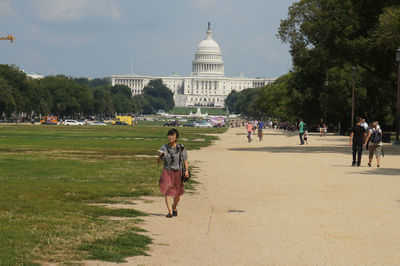 Washington D.C. is one of the kind in the country in that it is here where you will find national monuments, government run museums, and a whole lot of government. It is the only place in the country where the radio ads are from commercial companies, and sound like regular advertisements from anywhere else, but end with things like, “Buy A Dell Computer for Your Government Agency” or “We Provide Government Level Security.” It’s like a twilight zone . . . with a lot of speed cameras. It is also one of those places you’re supposed to take your kids to at least once during their childhood, but after that . . . you’re good. The best museums in the country are in New York City, the capital of finance and entrepreneurship. The government run museums of D.C., when the government is open, just seem to lack something. An aquarium in the basement of a Department of Commerce building with no need to worry about where it’s funding will come from just isn’t the same as the beauty and amazingness of the Boston Acquarium, SeaWorld Acquarium, Camden Acquarium or even the Brooklyn Acquarium. Washington D.C. is full of hotels. By searching various websites, you can find some pretty good deals from about $150-$300 night. The L’Enfant hotel was even $99 night on some websites. However, in downtown D.C. you will not be near any kosher restaurants. For that, you’ll probably want to stay in the DuPont Circle area which is near some kosher restaurants and the one synagogue with daily minyanim in D.C. – Kesher Israel. The synagogue also has information about a mikveh and Shabbos hospitality. There aren’t so many kosher restaurants in D.C. Most can be found in Silver Spring, MD or Rockville, MD. Follow the link to Rockville, MD to see our reviews of the food over there. A fairly complete list can be found on the local Vaad’s website, but call first to make sure the restaurant is open. The Monuments – You’ve got Jefferson, Lincoln, Vietnam Veterans, WWII, and so forth. 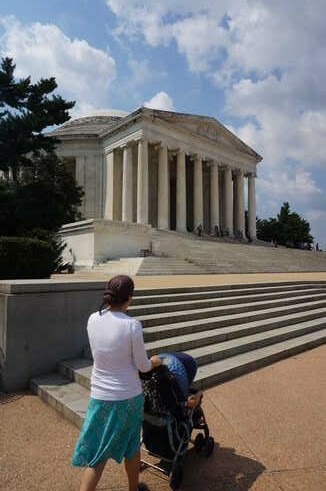 Jefferson’s and Washington’s are accessible easily by car. The rest require a lot more walking. Washington’s is a large tower that you can climb up . . . the rest, well, you just sort of look at and move along. You can spend between 10 minutes and all day, depending on how many you choose to see. honorable to replace thousands of years of Jewish counter culture and meaningful life with the holocaust as our identity. Why are there “Islamic Cultural Museums” but “Jewish Death Museums”? This, unfortunately, is the identity of too many Jews – but our history didn’t start in 1933 nor did it end in 1945. You can spend about 4 hours here. 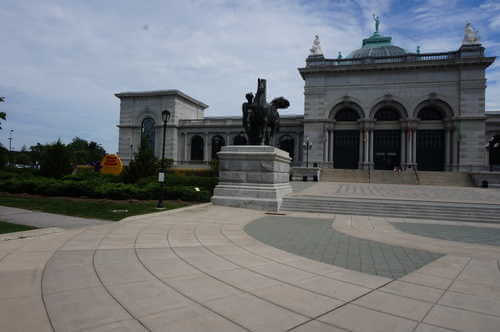 Smithsonian Museums – See the large horizontal green on the map above? Between the monuments and White House you can find lots of museums. The nice part about these is that they’re free. The downside is that anything free seems worth less in your eyes, but never fear, at the Air and Space Museum you can pay for very well down half hour planetarium shows talking about very recent and updated topics on space exploration. The rest of the museum, I never quite figured out the appeal . . . it’s a lot of hanging planes and whatnot, but the planetarium shows were great. When you get done with that one, you can pop into some of the rest in the vicinity. International Spy Museum – This is a private for-pay museum. It’s about 50% James Bond, 35% FBI/KGB, and 15% other. The James Bond parts are kind of like, “Hey look at all these cool gadgets, wardrobes, and movies.” The FBI/KGB parts are more like, “Yeah, that stuff you see in the movies isn’t real. We just kind of do everything we can to run from fights and not get in the middle of them.” The rest is a lot of cool stuff like the Enigma code wheels, ancient Chinese cryptography methods, government run counterfeiting during the wars, and so on. You can spend about 2-4 hours here. Across the street is the Portrait Gallery . . . it’s a government museum so it’s free to go inside. 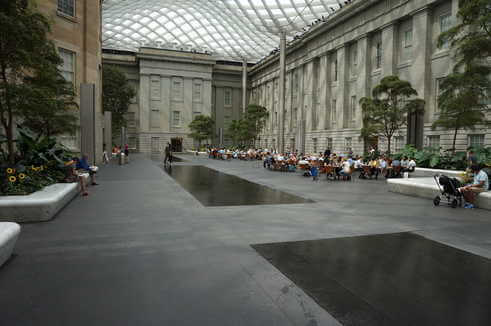 The museum is a rectangle with a beautiful atrium in the middle. It’s a great place to eat lunch. Bureau of Engraving – There’s a movie about printing money and then a walking tour where you see the money printing machines below you. It takes about an hour, but you have to, in government style, go to another entrance a block away to get tickets first. National Aquarium – As mentioned in the introduction, it’s in a basement of a Department of Commerce building. It’s decent, but fairly small and expensive. You can spend about an hour here. 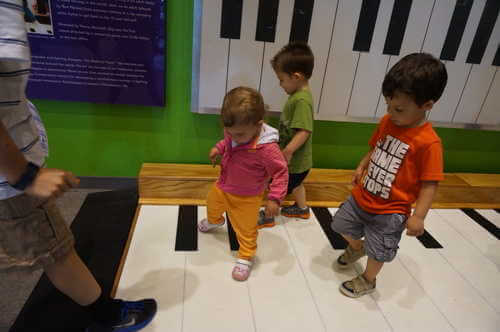 The D.C. Children’s Museum . . . for all ages, sort of. Children’s Museum / Waterfront – The D.C. Children’s museum is fairly nice. It’s similar to those you’ll find in other places, but our kids certainly liked this one.